Another busy and exciting term has ended here in Corville. When we return after the Easter break we will be on the home stretch. Until then we can enjoy the holidays, recharge the batteries and come back full of energy on April 9th. 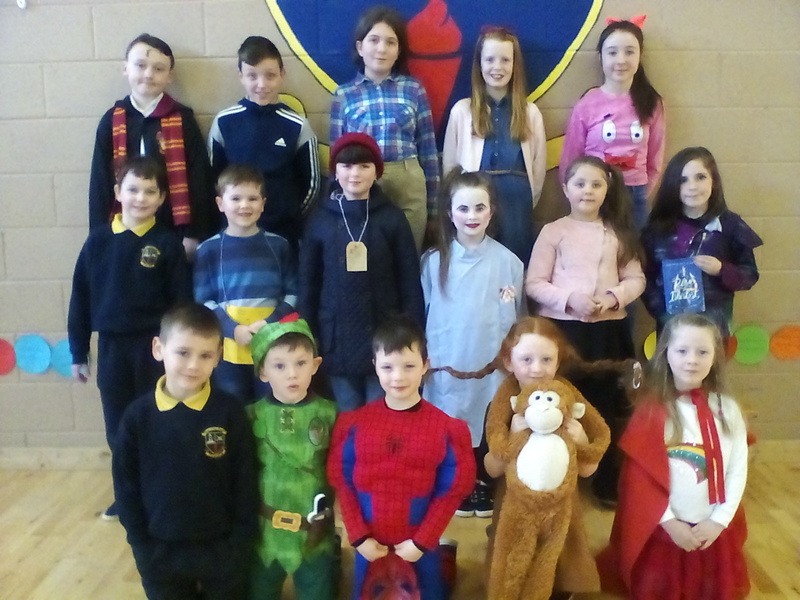 The main news item we have for you today is of course the 6th Class Confirmation which took place on Saturday, but we also have various class updates, competition winners, Seachtain na Gaeilge and the St. Patricks Day parade news to bring you. 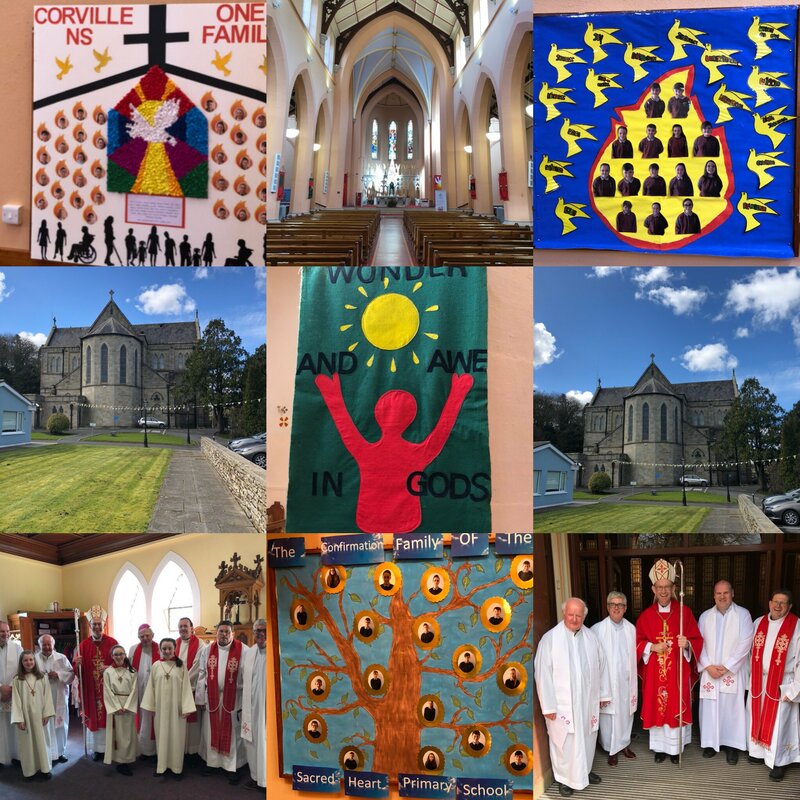 Confirmation: 38 students from 6th class made their Confirmation on Saturday in St. Cronan’s Church, Roscrea. A lot of hard work had been put in by the students and their teachers in preparation for the Confirmation and it was fantastic to wake up to a gloriously sunny morning on the big day. Bishop Fintan Monahan led the service and he was very impressed by all our students. The behaviour from everyone was superb so well done to all involved; you did us proud. 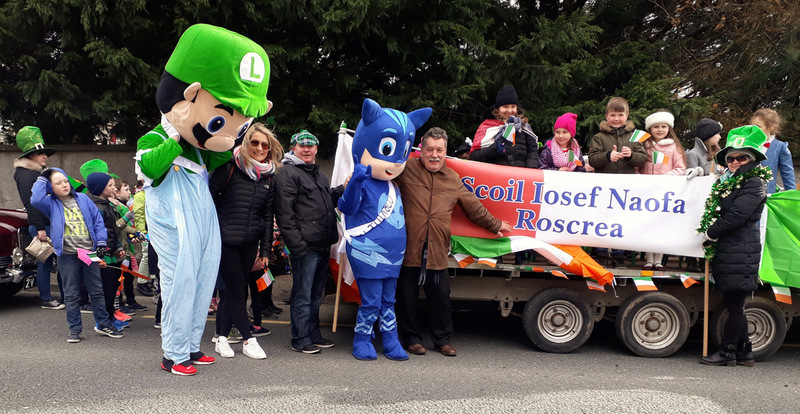 St. Patrick’s Day Parade: students from 1st and 2nd class joined teachers from the school to march in this year’s parade. 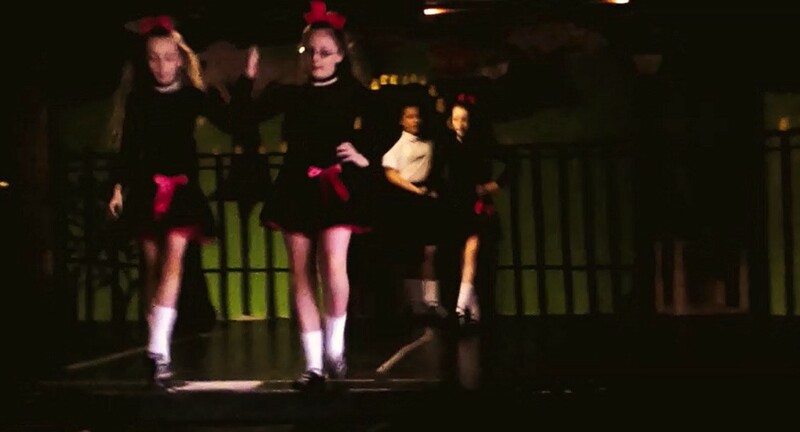 Similar to last year, the school took the opportunity to showcase their school play, which this year was Mary Poppins. It was a freezing cold day for the parade so fair play to all the students for coming out and singing all the songs from the play for the crowds on the street. You were all brilliant and the school managed to come 2nd in the overall category this year which was a big achievement! The school would like to thank everyone involved and especially the Searsons for providing a trailer and helping out on the day. School Day of Celebration – Flag Launch Day: the school has a massive day of celebration coming up on Tuesday, April 10th. We are going to be celebrating the launch of multiple flags that the school have earned over the last year or so. We will be celebrating in style with a helicoptor coming and landing in the school. A few lucky students will even get to go up in the helicoptor! We will be celebrating the launch of our Blue Active Flag, 6th Green Flag, Digital School of Distinction and soon to be had – Amber Flag! 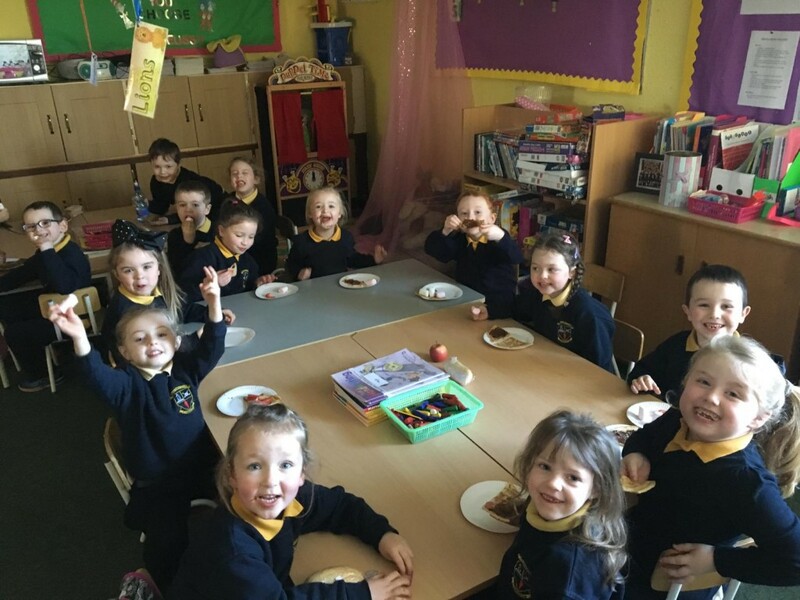 Not many schools in Ireland can boast as many awards so it’s time we celebrated our achievements in style. 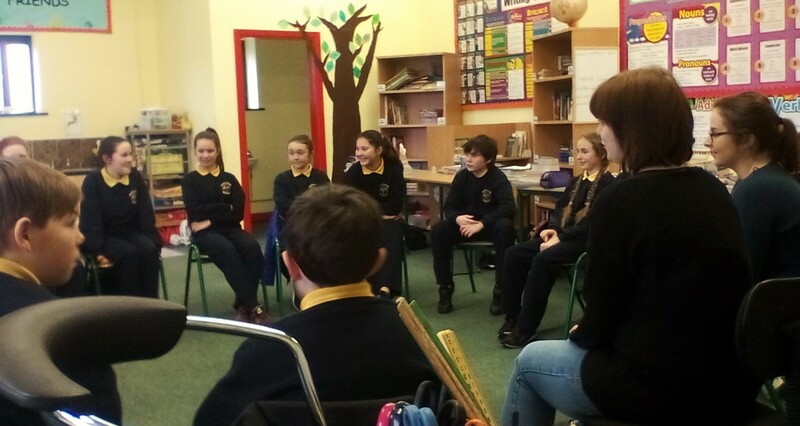 Seachtain na Gaeilge: Bhí an craic agus spórt againn an tseachtain seo caite. 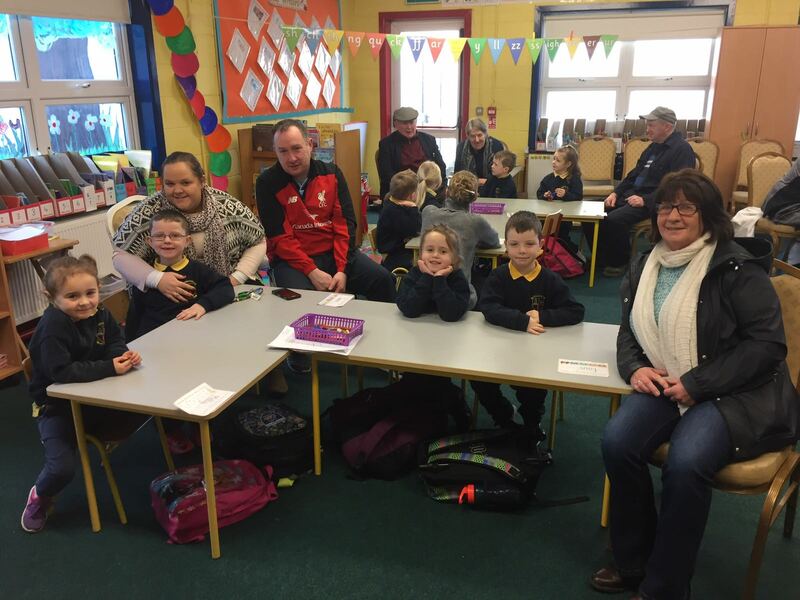 Bhí a lán imeachtaí ar siúil sa scoil í rith na seachtaine. 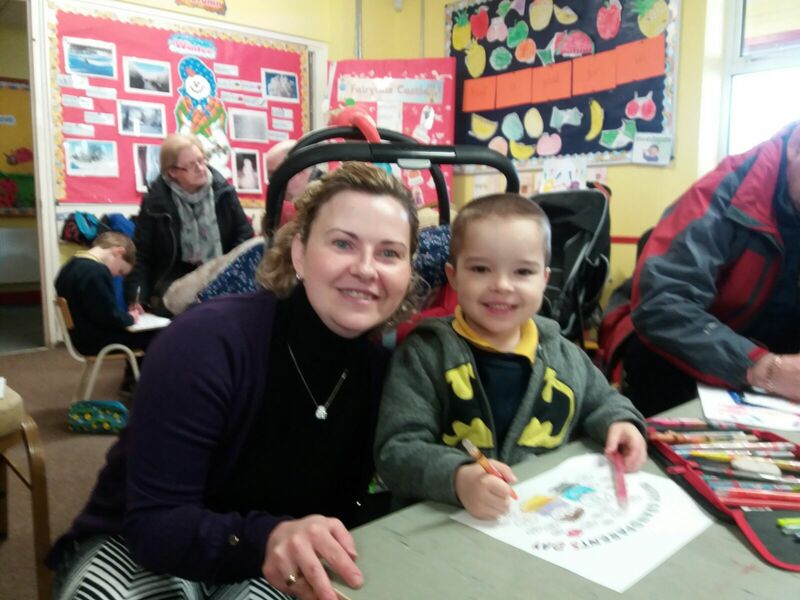 Bhí gach paiste ag caint as Gaeilge, ag úsáid an Gaeilge a bhí acu, ag damhsa agus ag canadh. Bhí Lá Glas againn agus bhí gach duine gléasta suas ín éadaí glas. Bhí Radio na Corbhille le fáil gach là roimh am lóin. 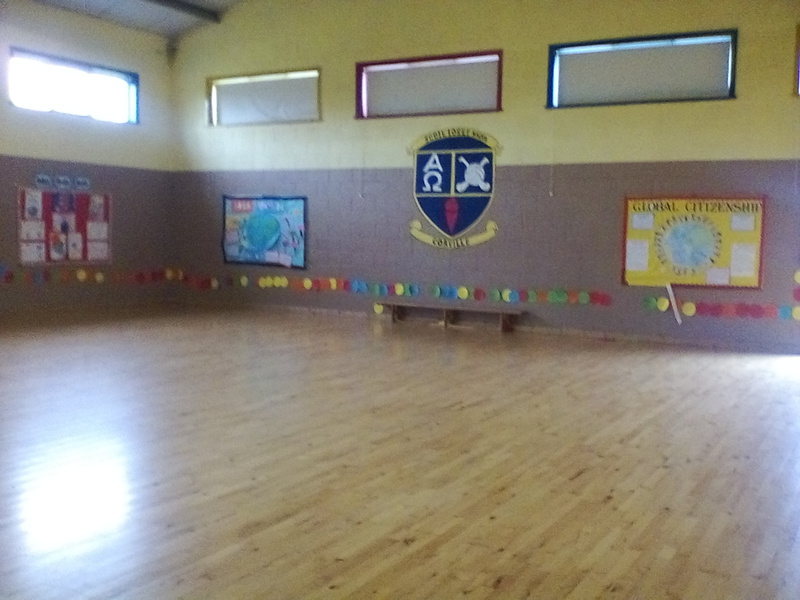 Bhí ranganna éagsúlla ag léamh Nuacht an Lae agus Dán an Lae. 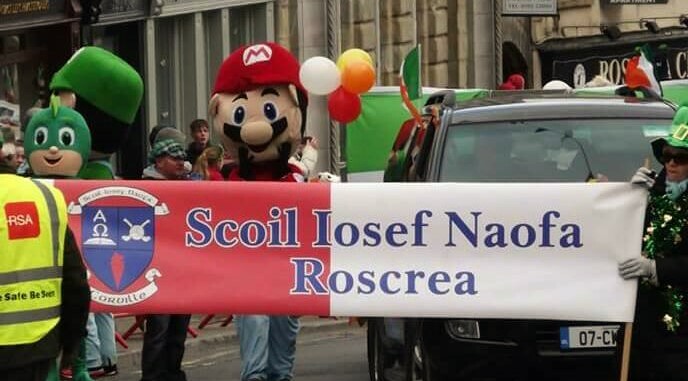 Bhuaigh cúpla paistí “Gaeilgeoir na Seachtaine” agus fuair siad certs ó Tuaisil Ó hÓgàin. 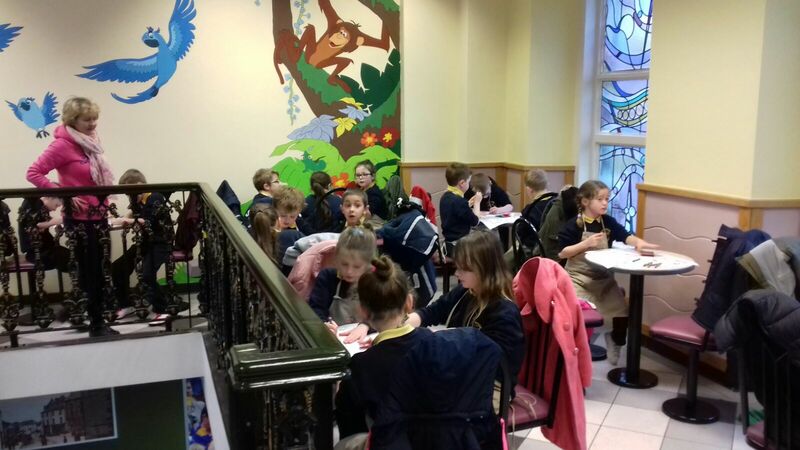 Bhaineamar an taitneamh as SNG 2018.
Credit Union Quiz Final: Best of luck to Senan, Karlo, Roy and Dan in the final of the U/11 Credit Union Quiz Competition. The final takes place in the RDS in Dublin during the holidays on Sunday, April 8th. 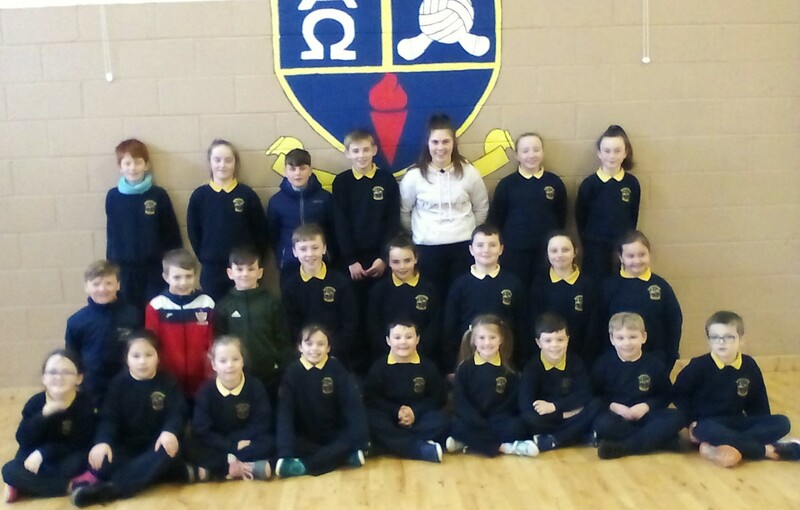 This is the first time our school have gotten to the All Ireland final so we are all very excited. The Quiz Master for the quiz will be RTE’s Marty Whelan. We will be giving updates via our facebook page on the day itself, so if you want to see how the team get on then pop over to our Facebook page. We are sure our Fearless 4 will do great! 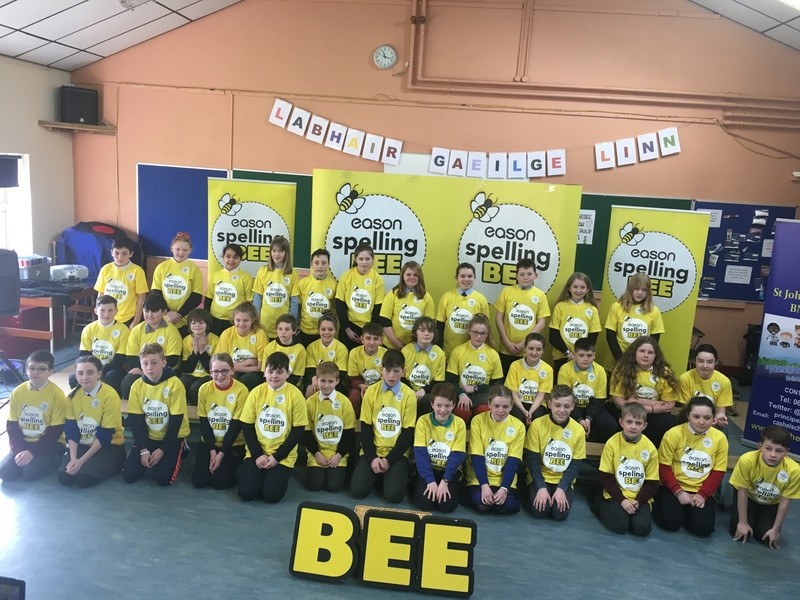 Eason’s Spelling Bee: Katelyn O’Rourke Morgan recently took part in the Eason’s Spelling Bee Competition. 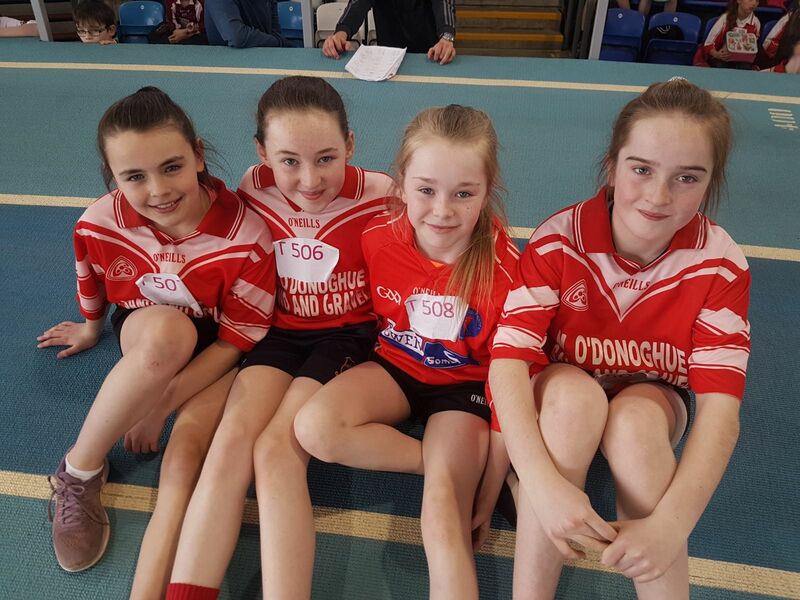 The Tipperary heats took place in Cashel and Katelyn had the task of representing the school. Katelyn made it through to the 3rd round before being eliminated. The school would like to thank Katelyn for all the hard work she put in. You did great! 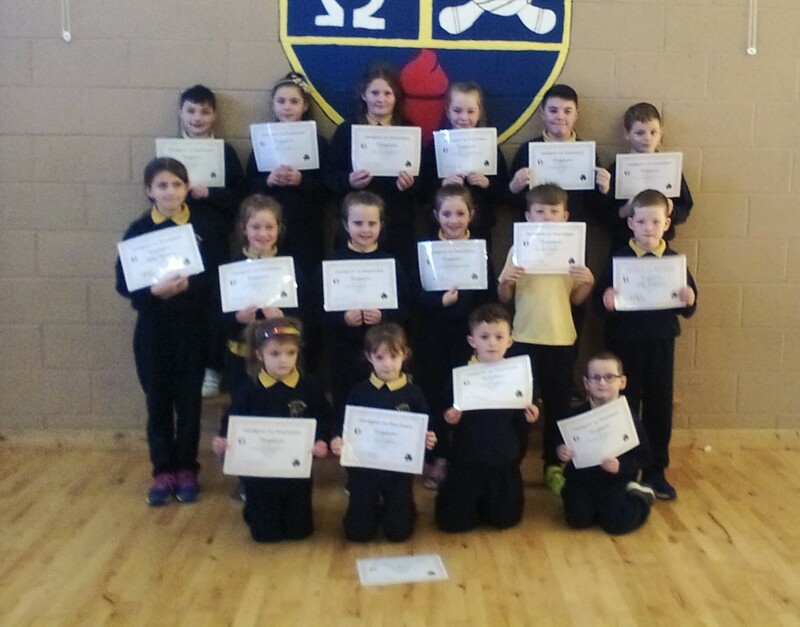 Easter Students of the Week: our lucky students of the week for Easter each received an easter Egg and free homework! 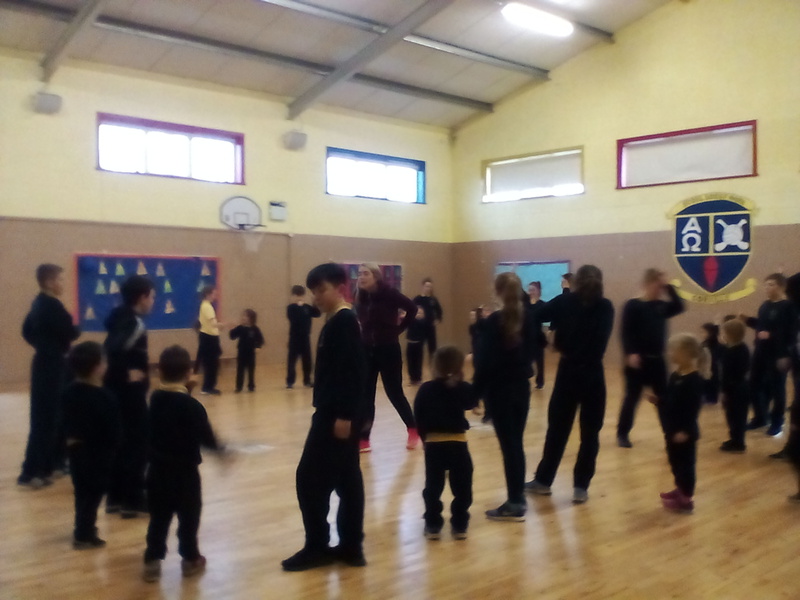 Assembly Performances: students from 2nd class put on a fantastic dance performance last Friday. 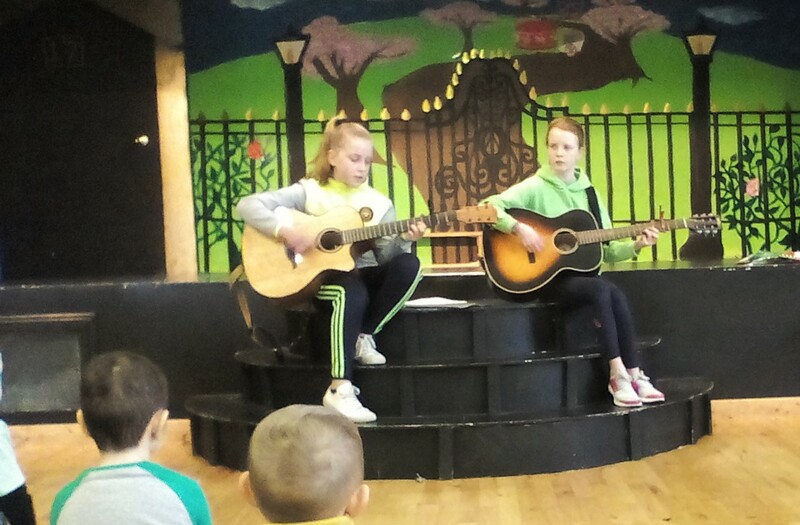 Also performing were Sarah and Ruby from 6th class. They did a great rendition of Ed Sheeran’s song ‘Perfect’. 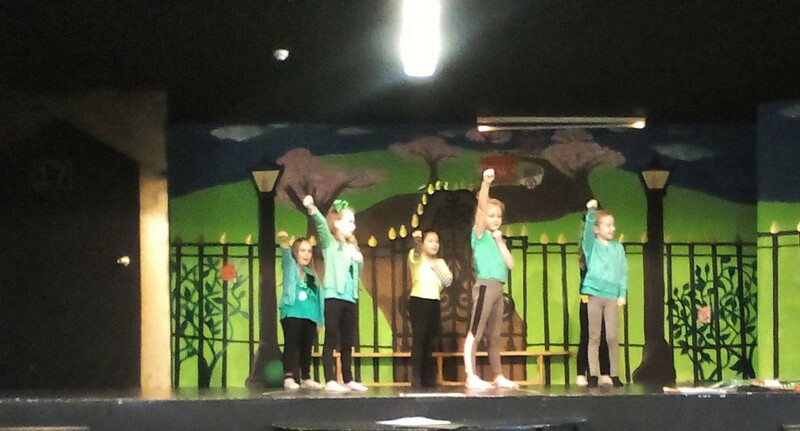 Finally we had 4 of our 4th class girls on stage doing some Irish Dancing for Seachtain na Gaeilge. 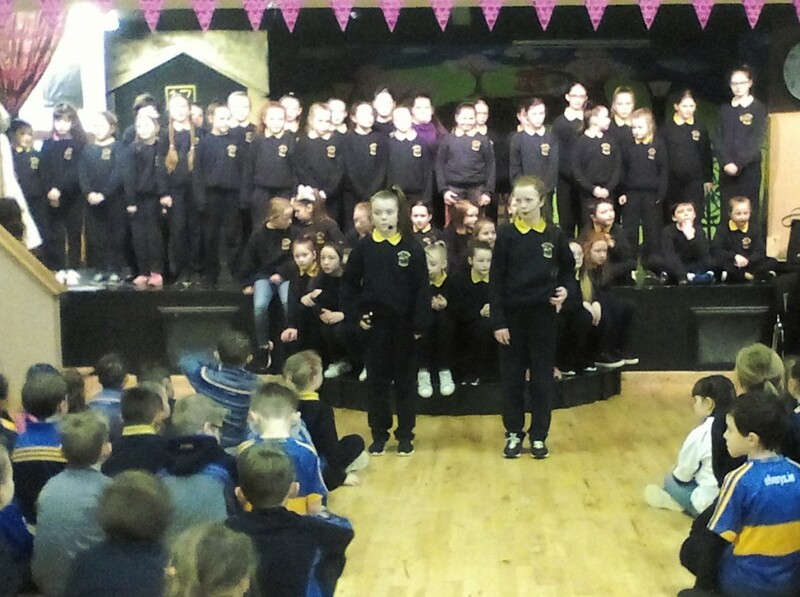 Click to watch a Facebook video of our 4th Class girls performing. 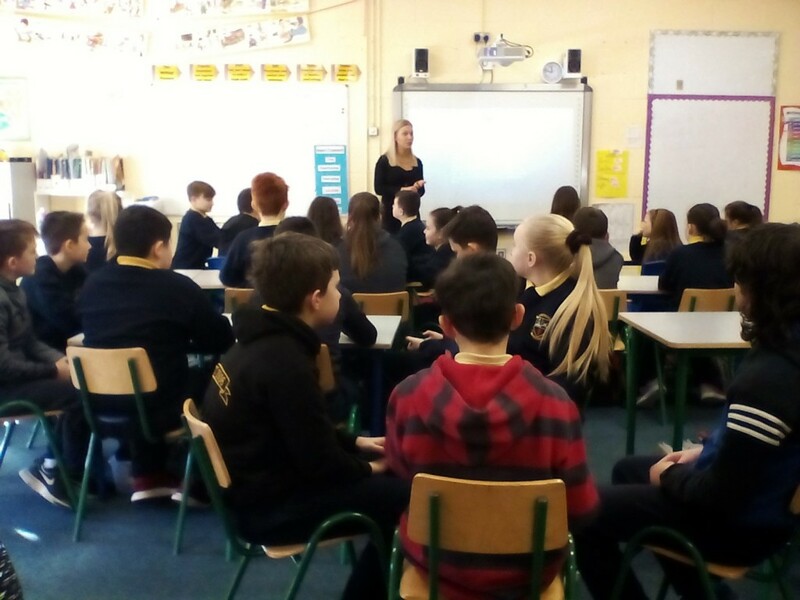 Health & Safety: students in Corville were given a very informative lesson on how to deal with incidents in the school. Areas covered included dealing with someone in cardiac arrest, recovery positions, calling for help and they were also shown how a defibrillator works. 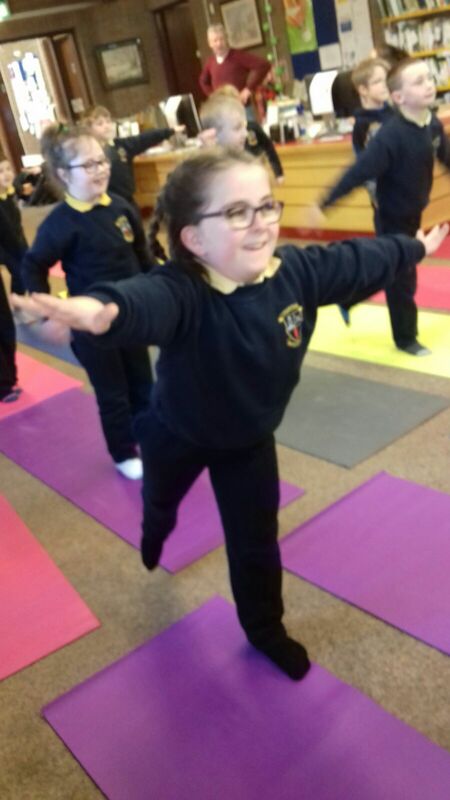 1st Class do Yoga! 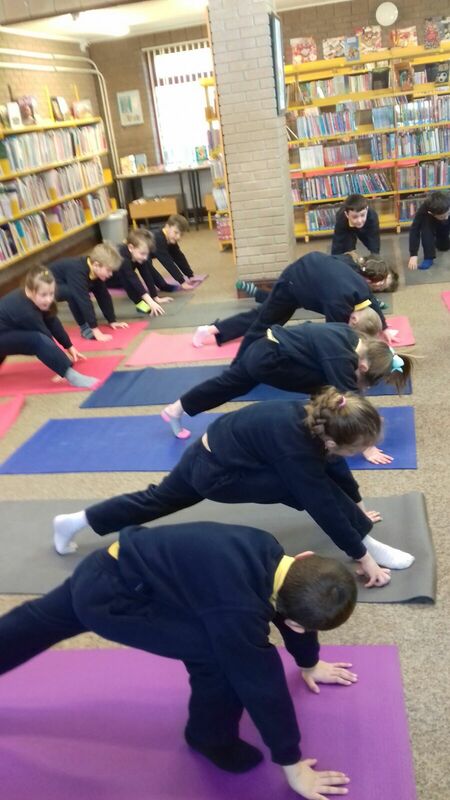 our first class students were recently invited down to the library to take part in a yoga lesson. They had a brilliant time and they were all very relaxed afterwards. More photos on our Facebook page. 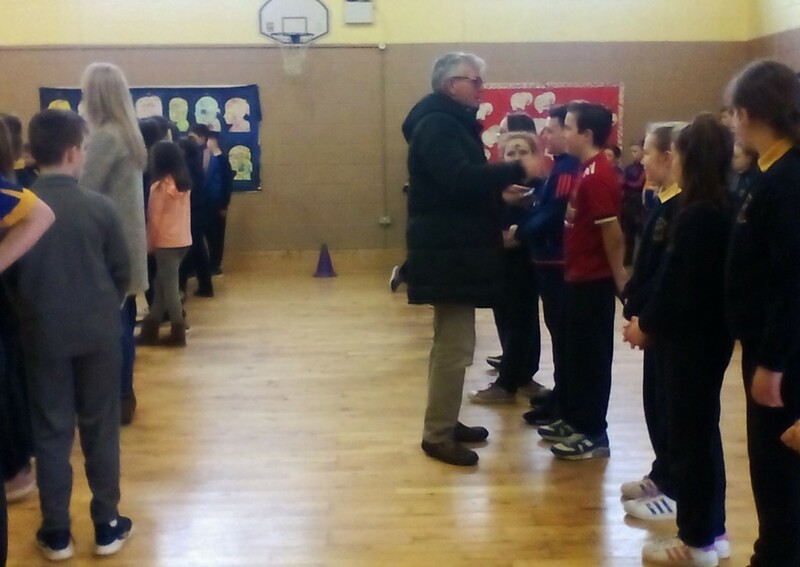 Road Safety Presentation: our 5th class boys and girls were given a road safety presentation by Richard and Alan from Super Value. 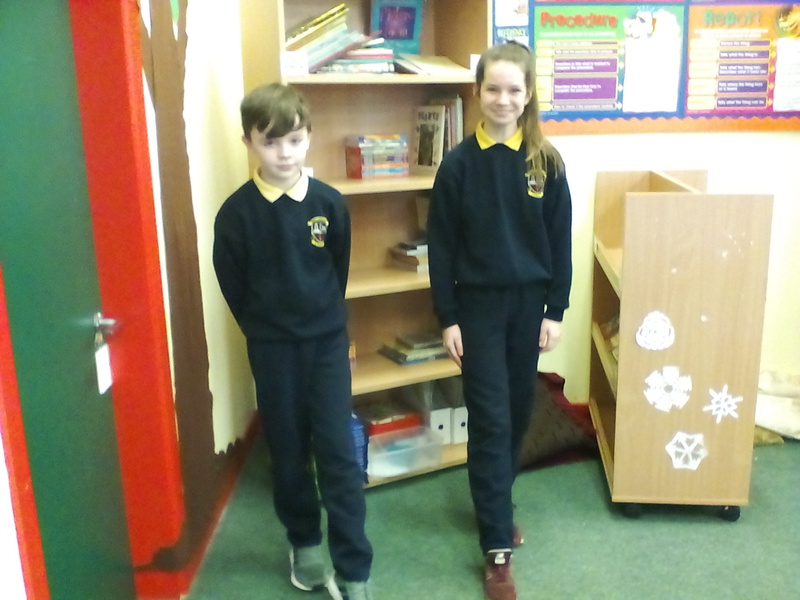 They learned all about how to stay safe on our roads when walking or cycling. 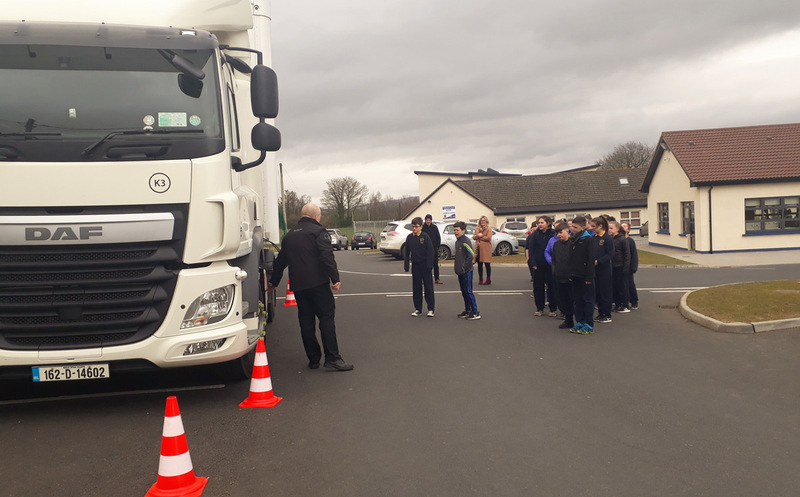 They learned all about the important of being seen, making sure drivers can see you at all times, and most importantly not cycling down the inside of truck if that truck is turning as the truck driver won’t see you because of the blind spot. 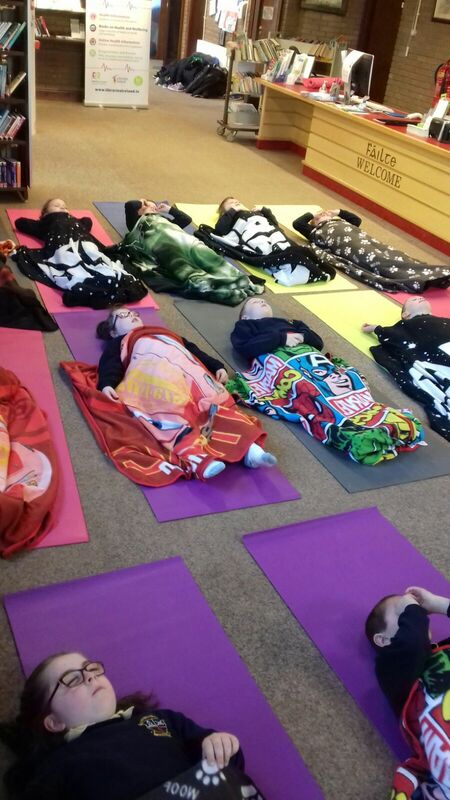 Each class was brought out to see the blind spot for themselves. It was illuminating to see just how dangerous it can be when the truck driver can’t see you. 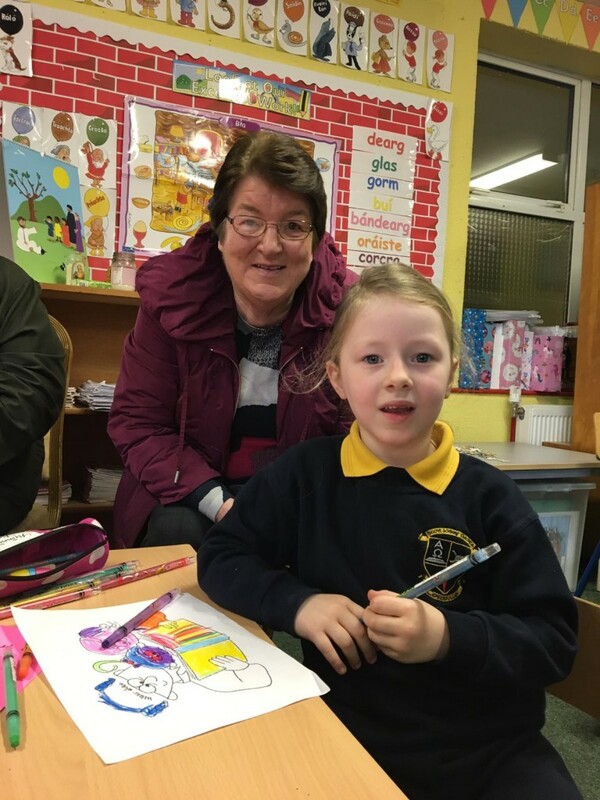 Easter Egg Winners: Lidl came to school and gave all junior and senior infants Easter eggs for participating in the colouring competition. 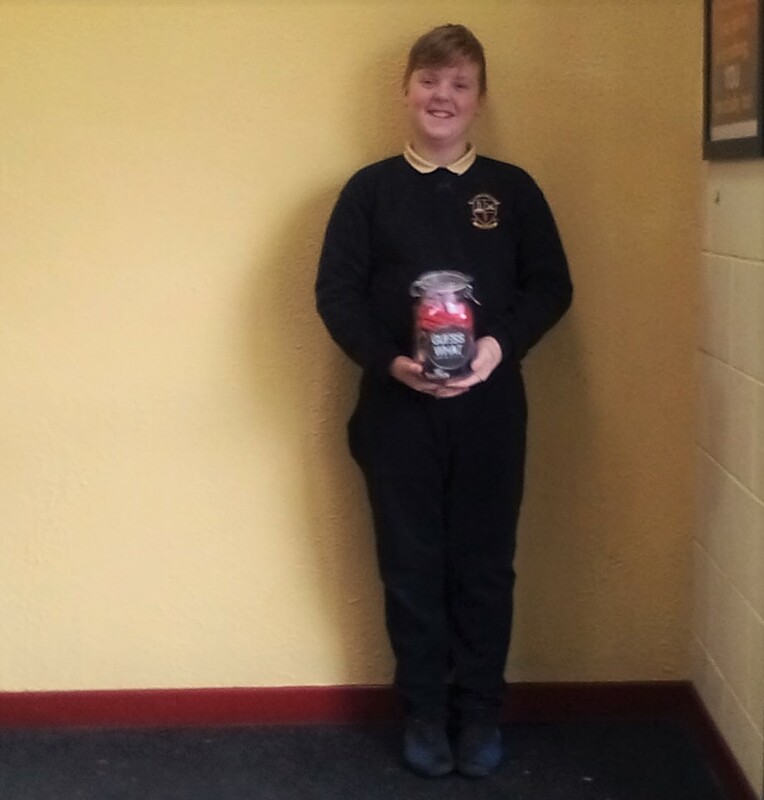 Brandon Dooley in Ms. McMahon’s class won the competition. He won an art set. 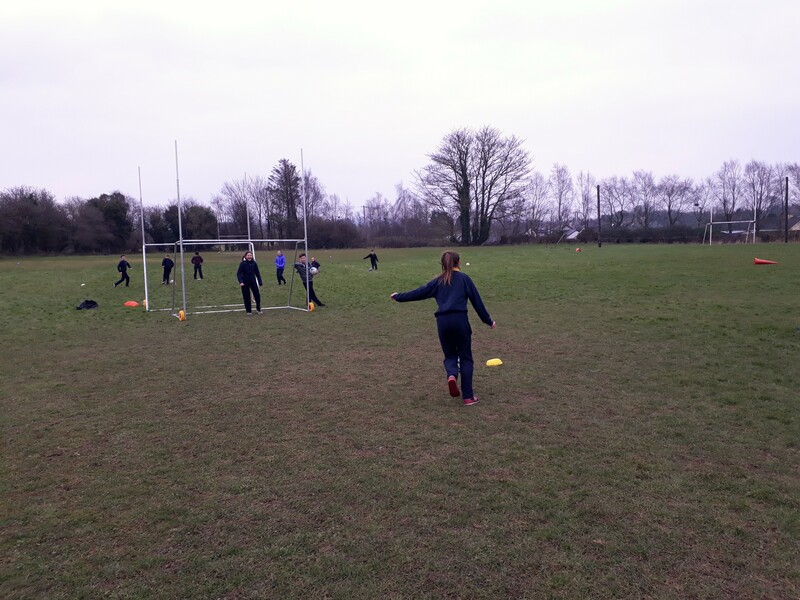 Tag Rugby Blitz: Corville recently took part in a rugby blitz against all the other local schools. This proved to be a very enjoyable day out and it was all just a bit of fun. 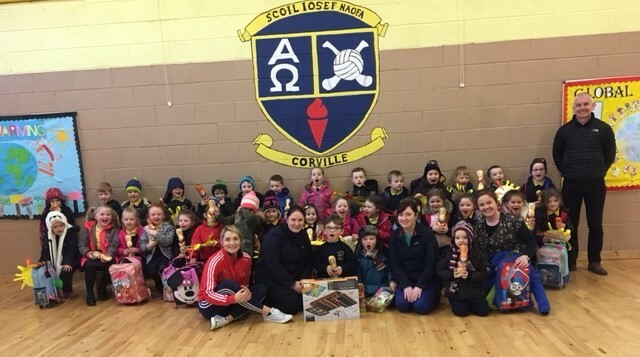 The Corville team consisted of boys and girls from 5th and 6th class. Spring has sprung and is flying by. 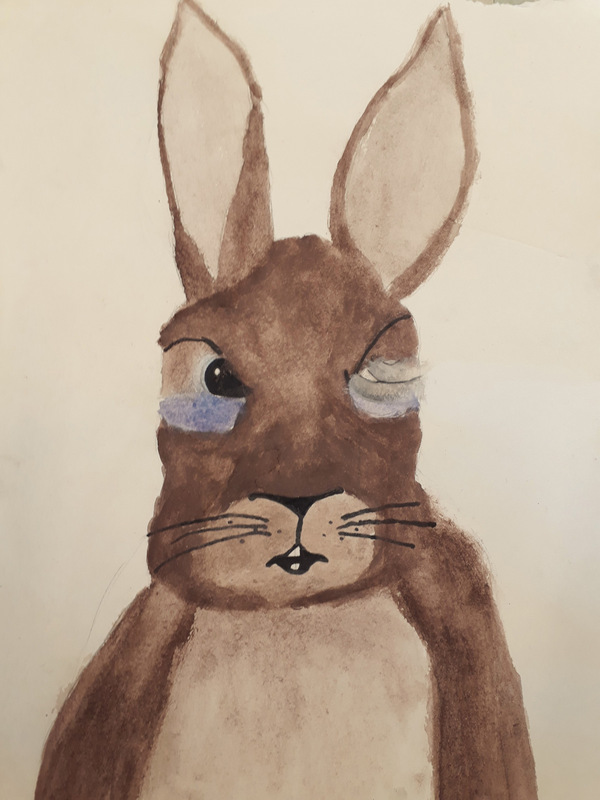 There are only two weeks to go until our Easter holidays and there is just so much going on in the school that we better update you all. 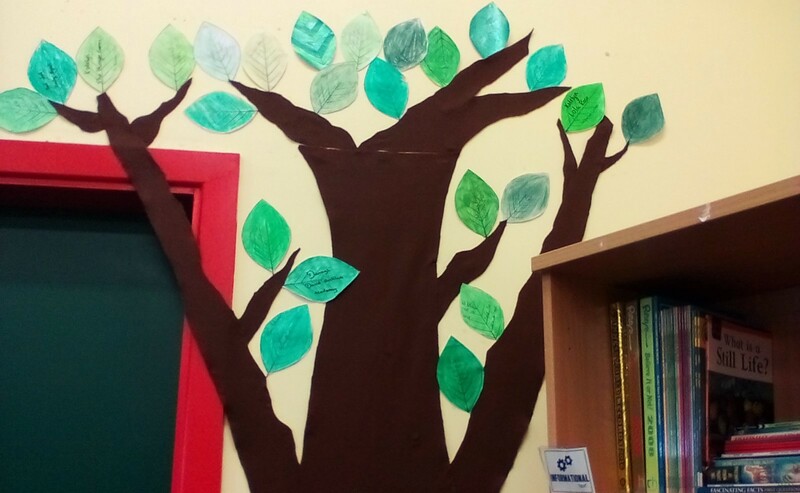 We celebrated Literacy Week last week, we secured our 6th Green Flag, we had a huge breakthrough in the Credit Union Quiz competition, we have Erasmus updates, 6th class blog updates, classroom updates and plenty more besides all that. Enjoy. Sat, March 17th – St. Patricks Day Parade – Corville will once again be marching so come and show your support. 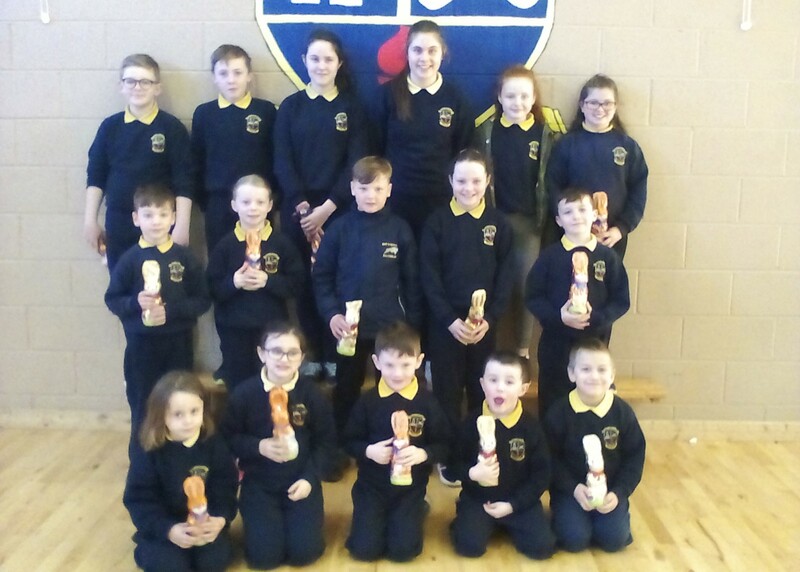 Tues, March 20th – Ceremony of Light for 6th Class at 7:00pm in St. Cronans. Sat, March 24th – 6th Class Confirmation at 2:00 in St. Cronans. 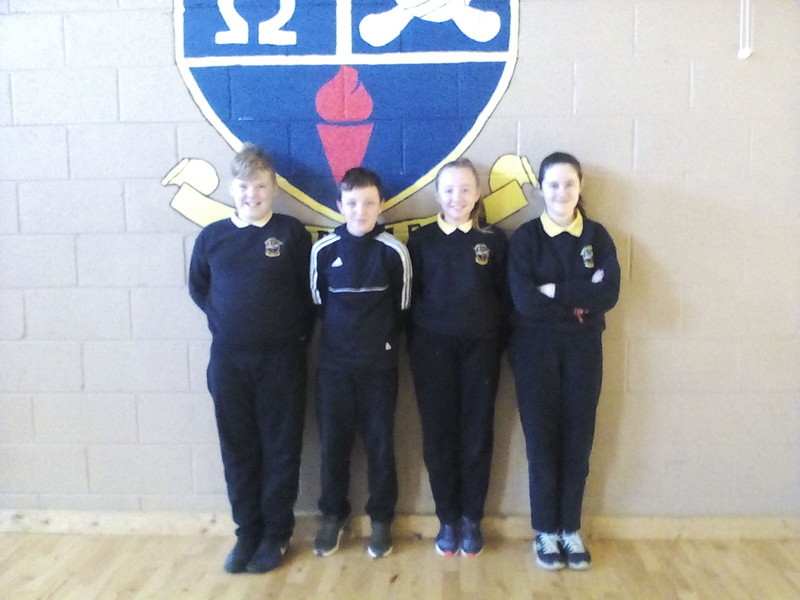 Credit Union Quiz: Chapter Round – our U/11 quiz team of Senan, Karlo, Roy and Dan were entering into unknown territory last Friday as they took part in the second round of this quiz for the first time in the schools history. 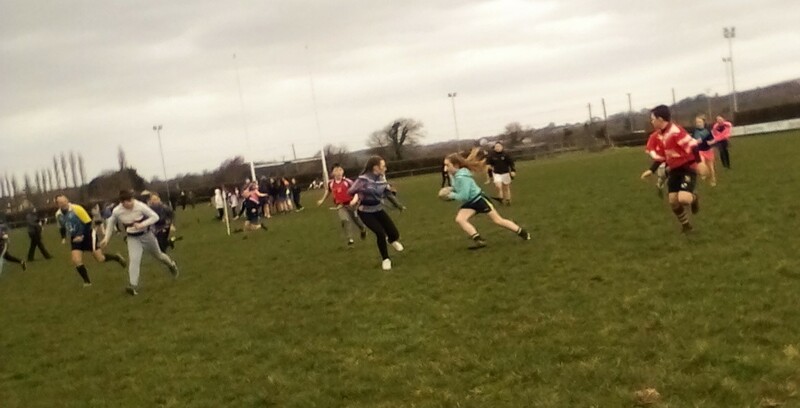 After winning the first local round, the team were up against the best Tipperary had to offer. Our team rose to the occasion and won through to the All Ireland Final which will be held in the RDS in Dublin sometime in April. This was a thoroughly deserved result after all the hard work the team put in over the last few months and the journey doesn’t stop here. Congrats to everyone involved from teachers and students to the parents who quiz them at home. Super stuff! We wish the Corville team all the best in the final but there is plenty of hard study to be done before that!! Facebook: our Corville NS Facebook page ( https://www.facebook.com/CorvilleNS/ ) is becoming extremely popular. In a little over a year we have gained over 300 followers and we should hit the 400 mark by the end of the school year. Our Facebook page is always a good place to go to get photos and news. Show your support by liking our page and stories and feel free to leave a positive comment too. 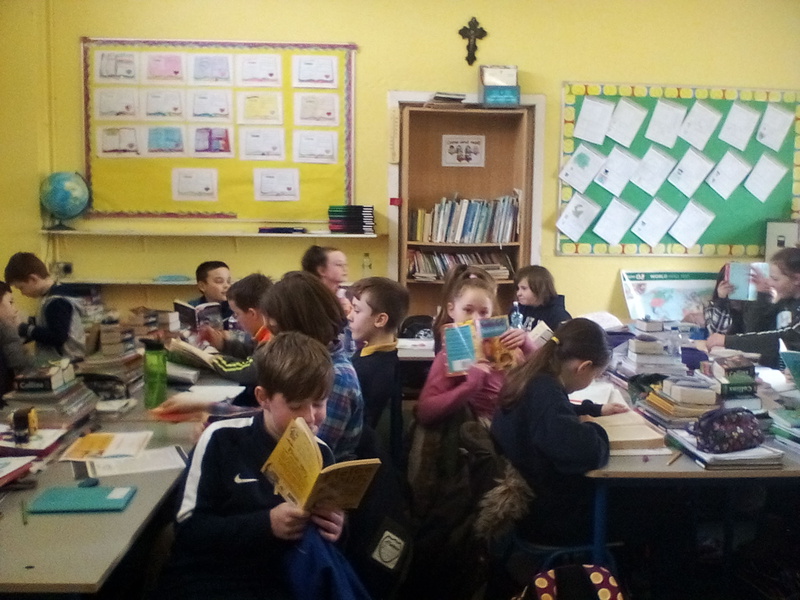 Literacy Week: last week we celebrated Literacy Week in the school. 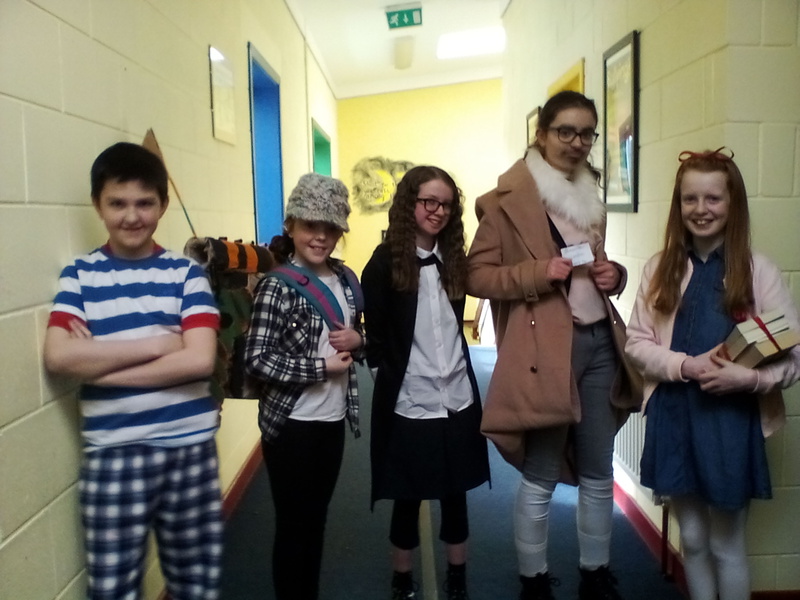 The students took part in a wide range of interesting activities from quiz competitions, Spelling Bees, and fancy dress to Drop Everything and Read and sound competitions. Congrats to all the students that won prizes during the week. 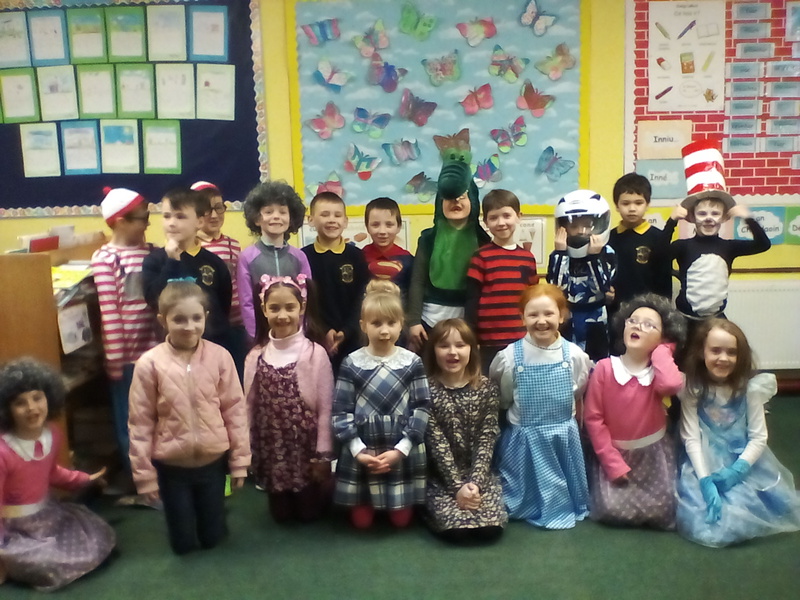 As part of Literacy week, the children were invited to dress up as a literary character of their choice on Friday. I can safely say I have never seen as many Harry Potters in one building room! 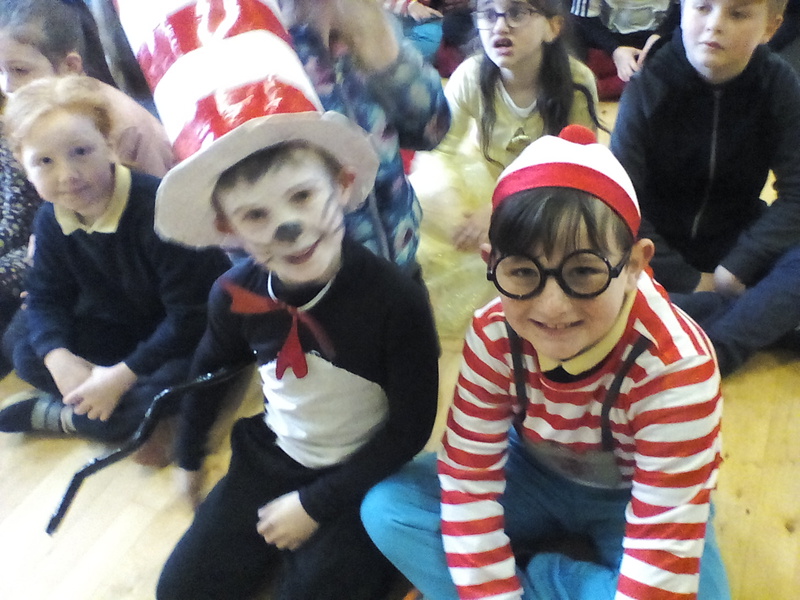 The children all looked great and they really enjoyed the day. 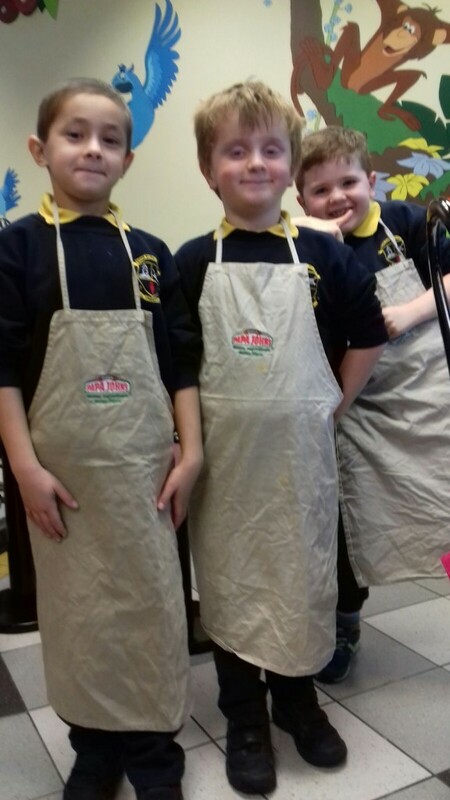 Our Students of the Week look a little bit different this week! Mr. Stapleton under pressure during the Teacher’s Spelling Bee Competition. 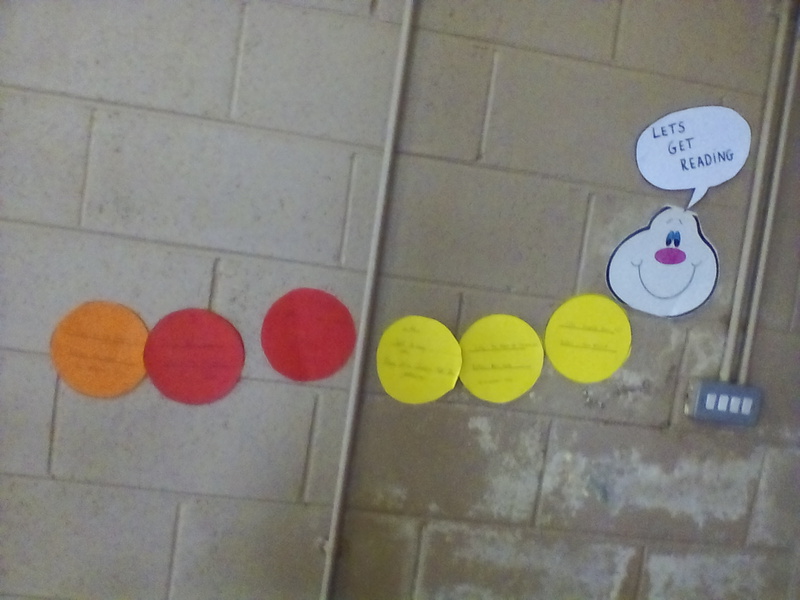 Book Caterpillar – every time a student read a book during Literacy Week we added another segment to the body. 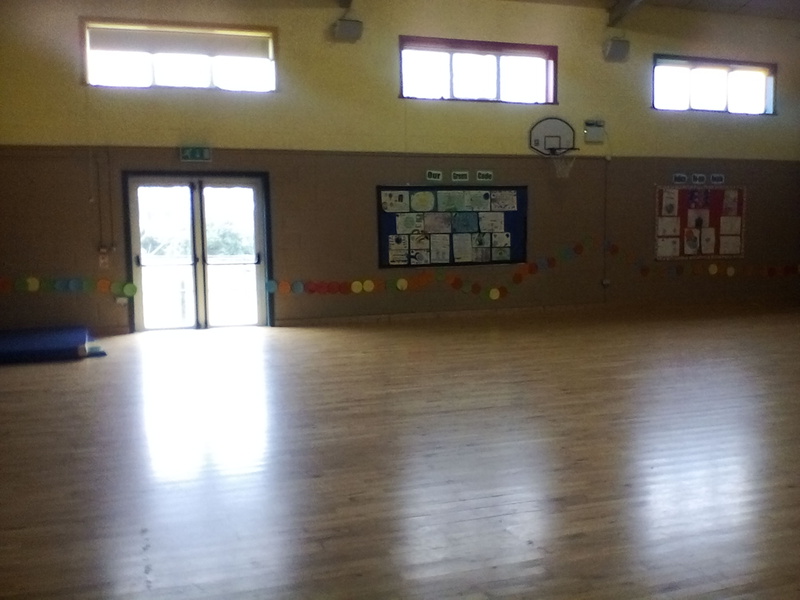 It eventually stretched all the way around our big hall! 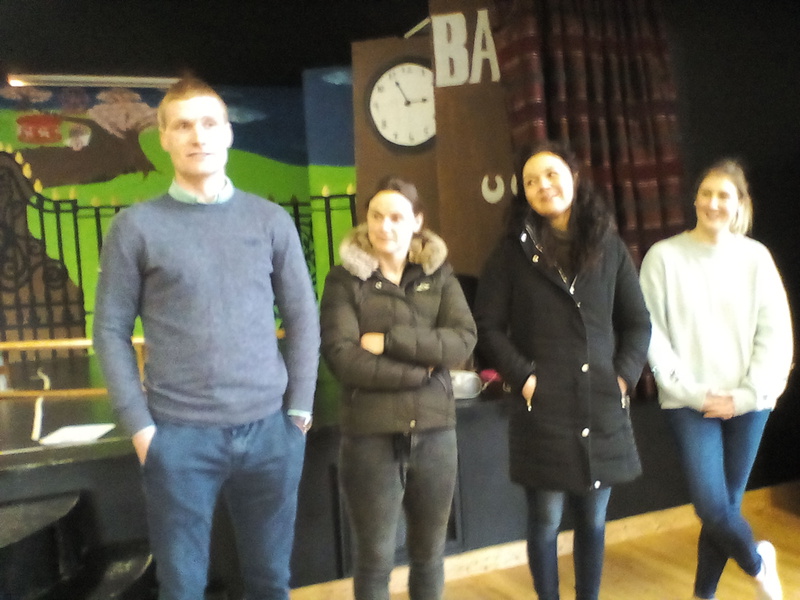 6th Green Flag: last week the school had a visit from the Green Flag inspection team. This year we were targeting our 6th Green Flag! 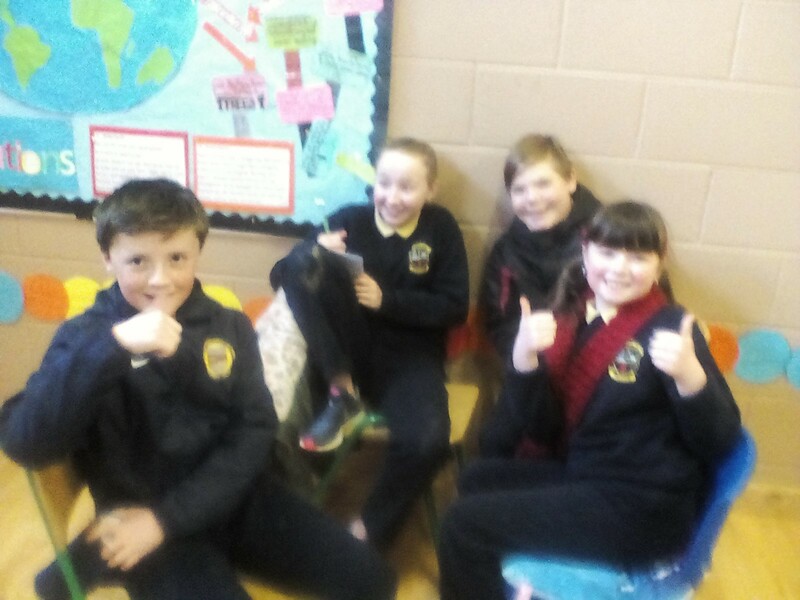 The boys and girls that were involved in the Green Schools Committee had been working very hard for a long time on this project and they did themselves proud during the inspection. 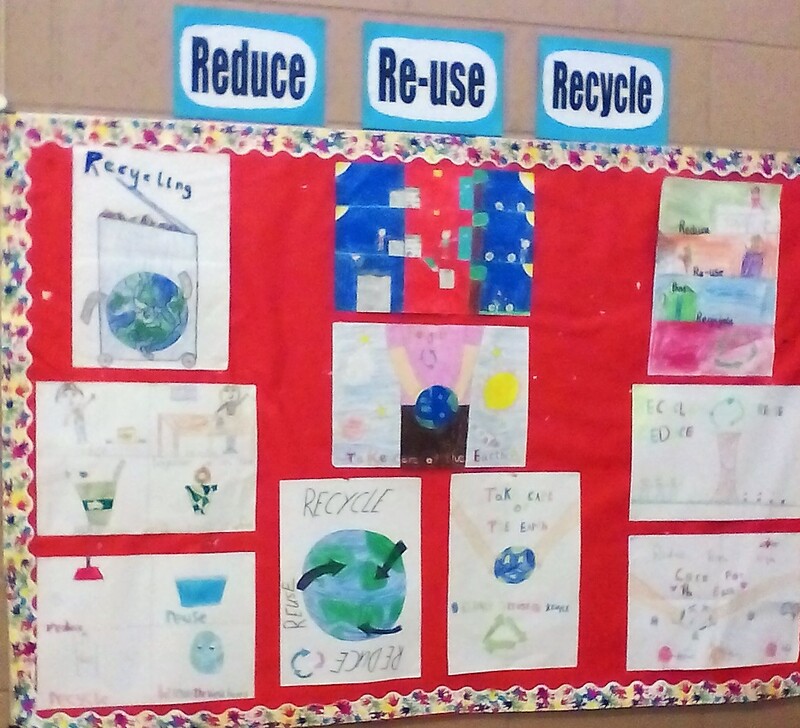 There were a multitude of projects on display for the visit all based around the theme of Global Citizenship and Reduce, Reuse, Recycle. 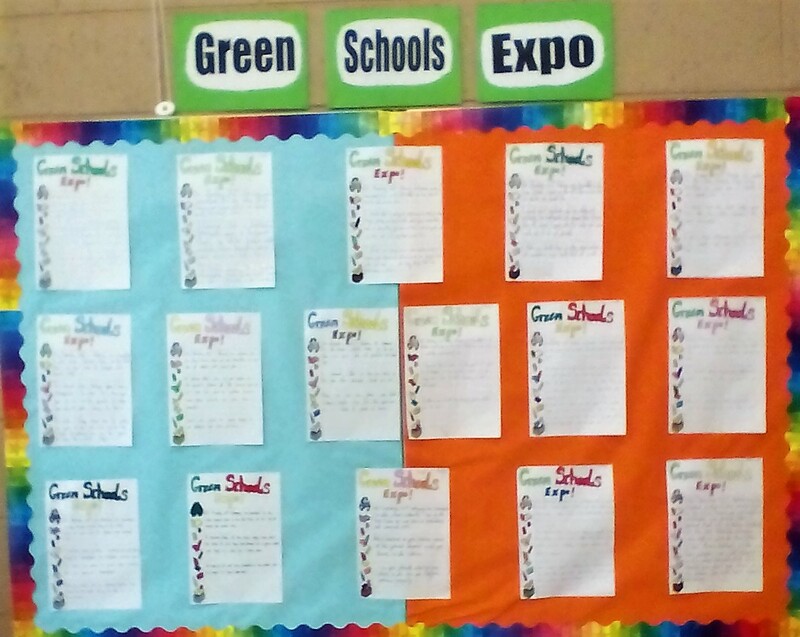 The committee attended the Green Schools Expo up in Dublin as part of this process. 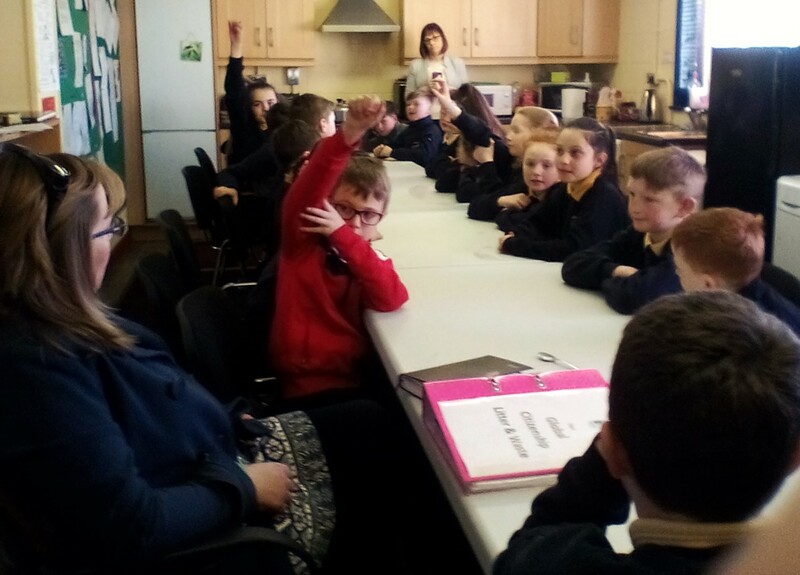 They really enjoyed the trip and learned lots about how to make the school greener. 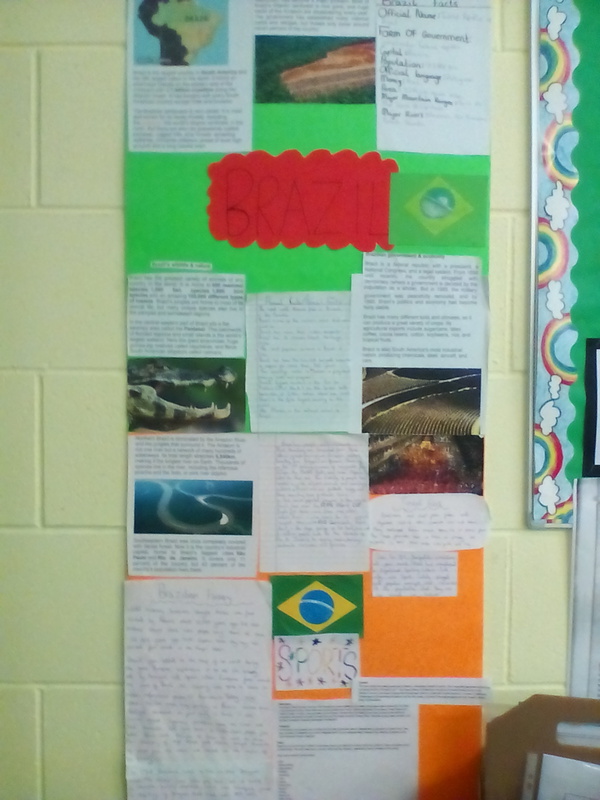 They put a project together based on their trip which you can see below. Congrats again to all the teachers and student involved. 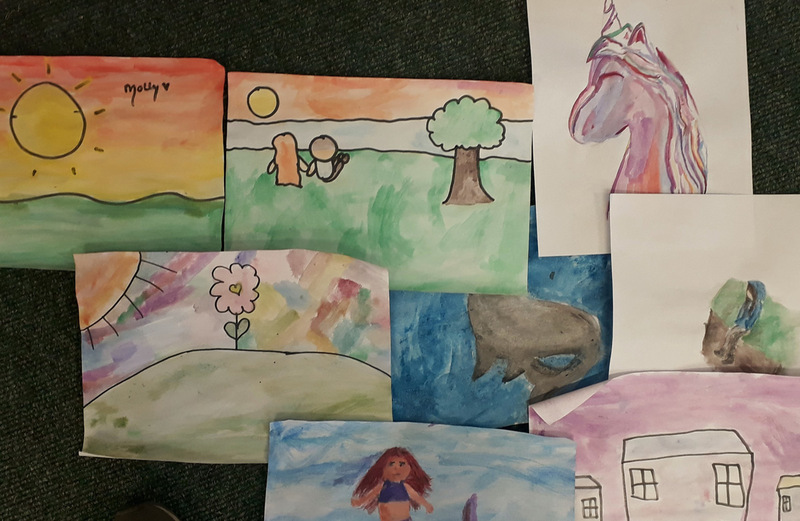 Erasmus: as part of our Erasmus+ programme where Corville link up with many different schools from across Europe, our classes were tasked with completing various interesting projects. 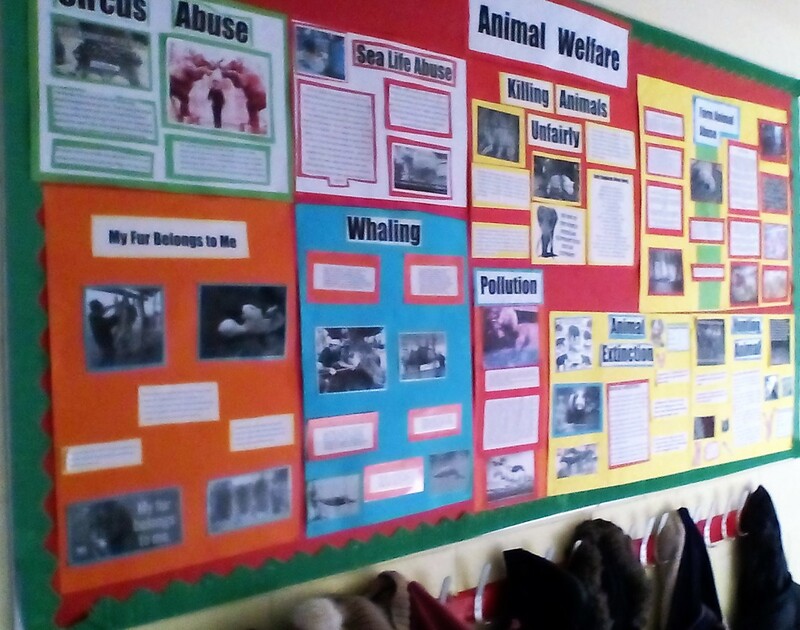 The projects varied from Animal Welfare to Fair Trade and studies of industry in various countries. 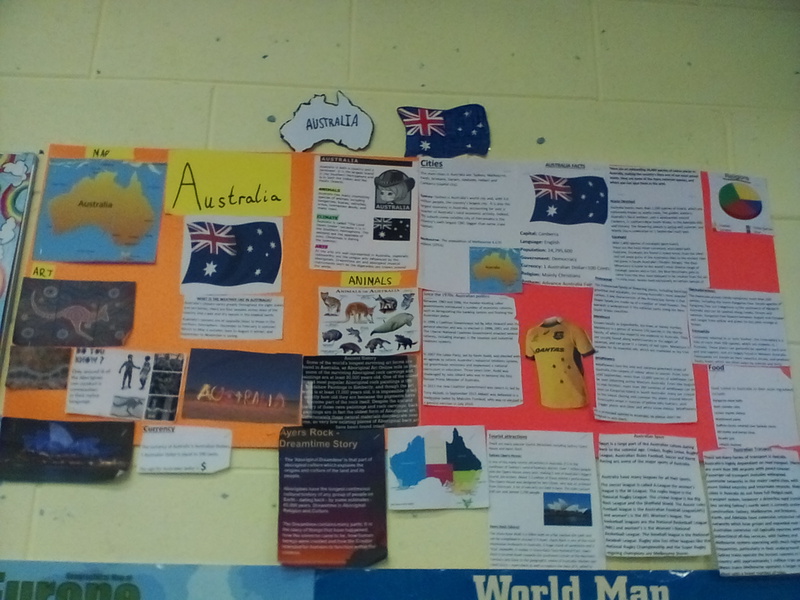 The students all worked very hard on their projects and learned lots from undertaking this task. 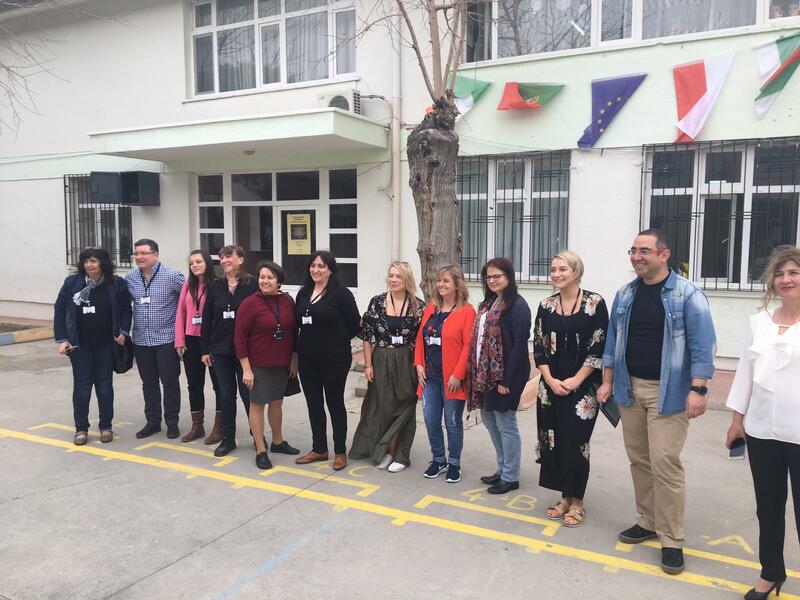 Last week, teachers from the school paid a visit to a school in Turkey. They got to see first hand how Turkish schools operate. They met the Director of Education in Kusadasi and got to visit lots of fantastic sites around the area. You can see a photo of all the Erasmus team (Bulgarians, Portuguese, Polish, Irish and Turkish) below. 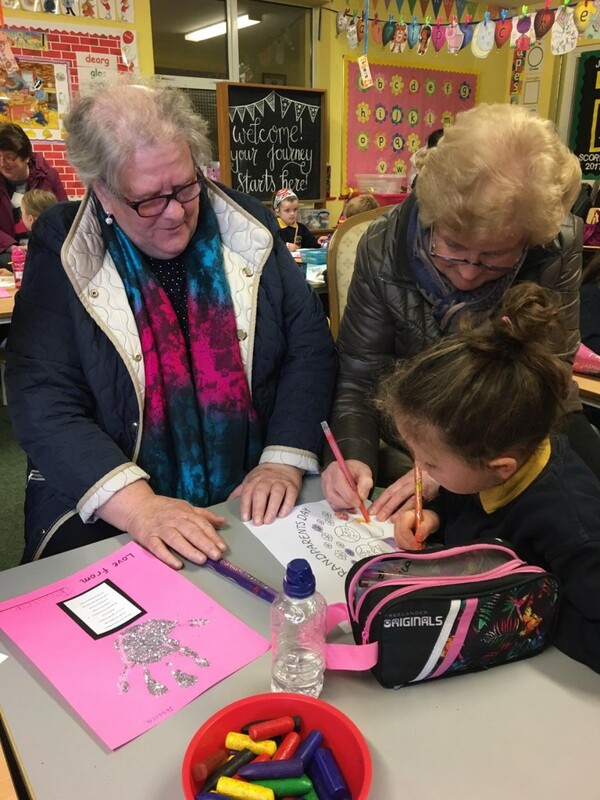 They also taught lessons to the children telling them all about our school in Corville and the super things we get up to. 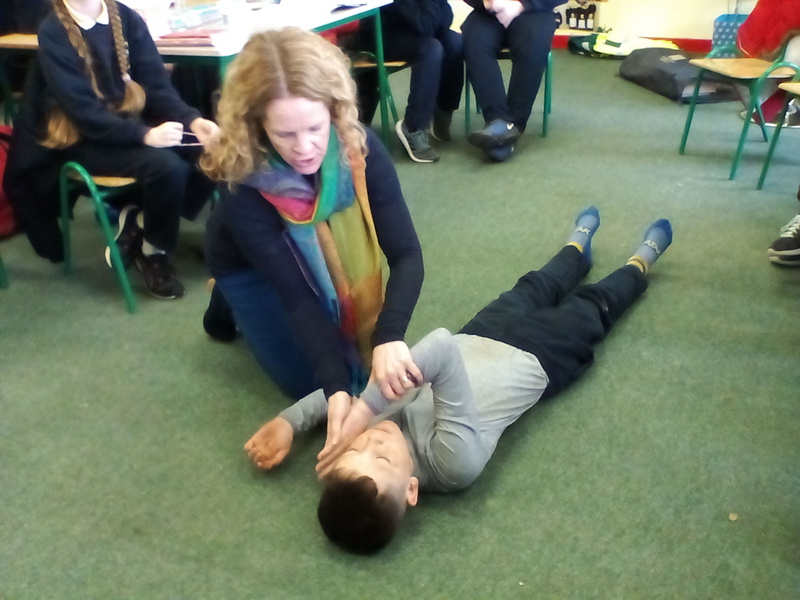 The children were most impressed when Ms. O Gorman played the tin whistle and showed them a video clip of hurling. 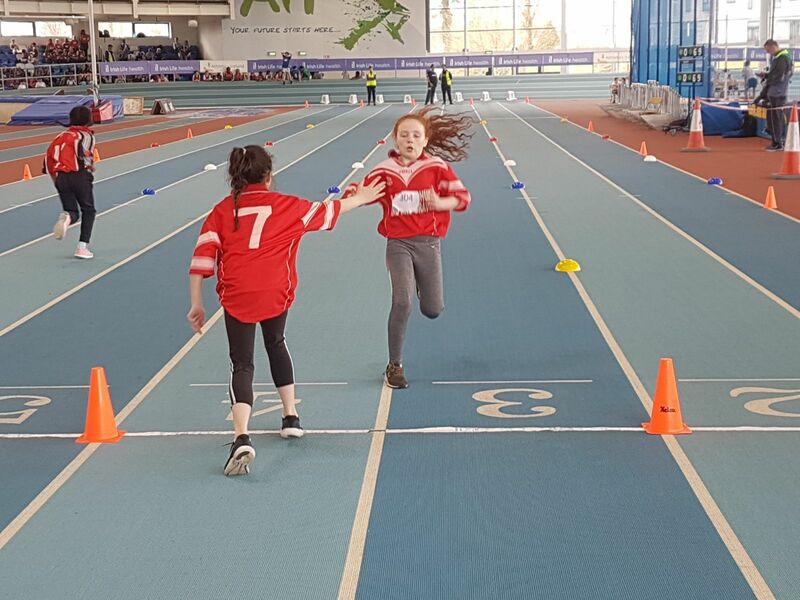 Athletics: 3rd, 4th, 5th and 6th class girls have been chosen to represent Co. Tipperary in the National Inter Schools Sportshall Athletics Festival. 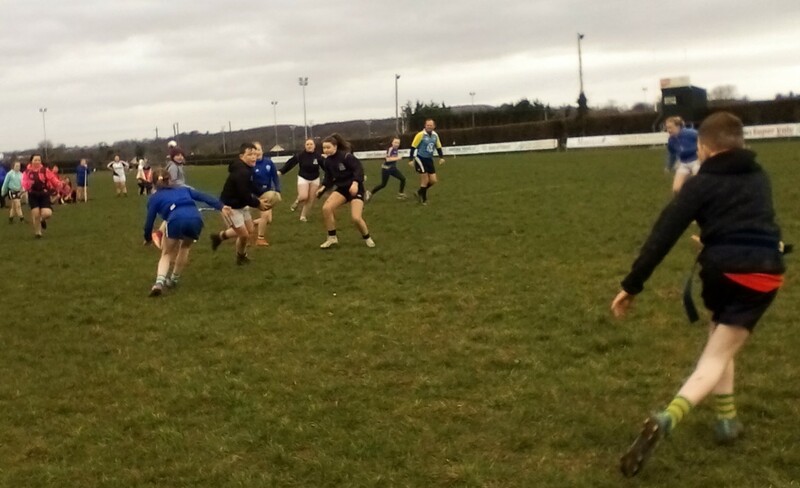 The girls have been training very hard and are really looking forward to the event which will take place in Athlone on the 21st of March. Best of luck girls! 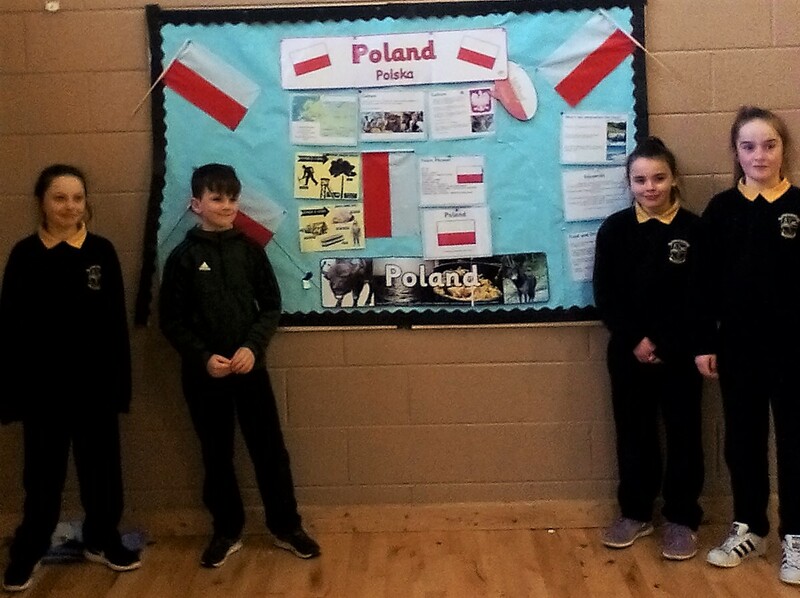 Student Wall of Fame: the school loves to celebrate the many fine achievements of our past pupils. You may have left the school but we still track your progress with great interest. 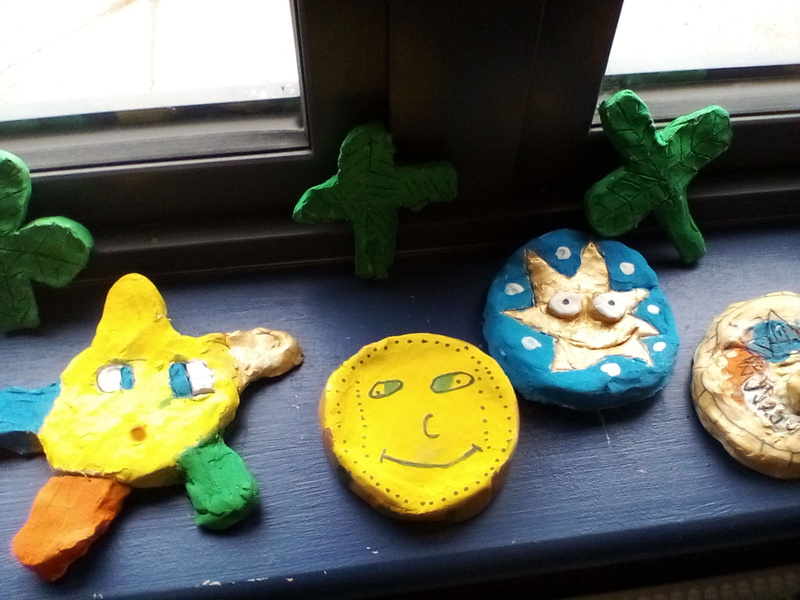 We have our own little Hall of Fame in Corville now which we hope will inspire the next generation of super stars in the school. Work hard and good things will happen! 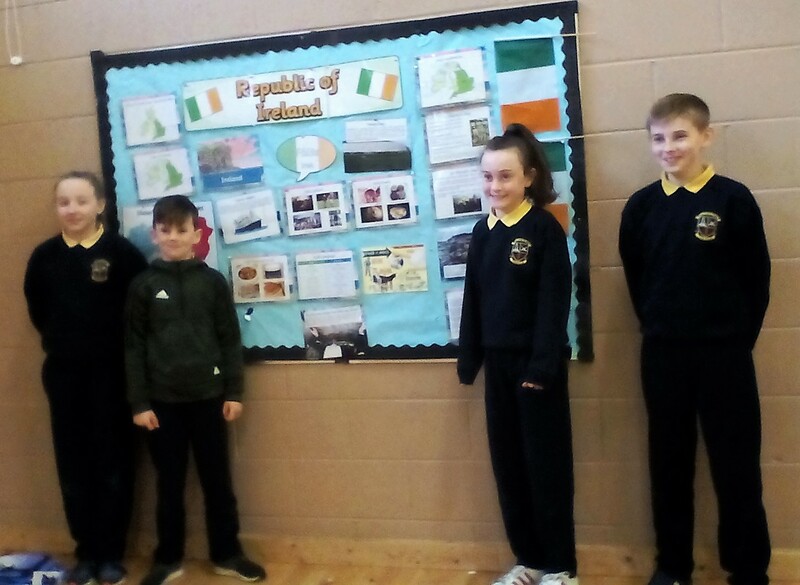 6th Class: we are very busy doing our Geography projects at the moment. Groups of 3 or 4 are working on different countries. We are also busy getting ready for Confirmation on the 24th of March. We will be attending the Ceremony of Light on Tuesday 20th of March at 7:00pm. 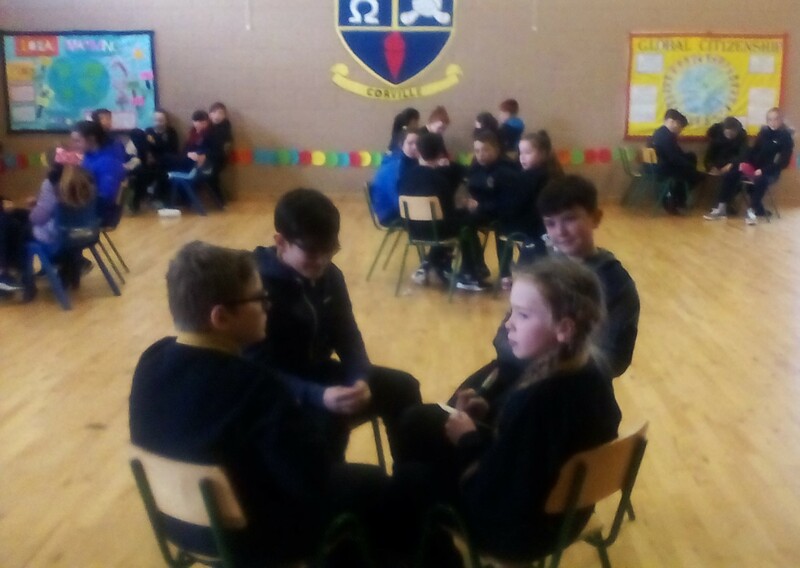 2nd Class: we made our first confession this week. 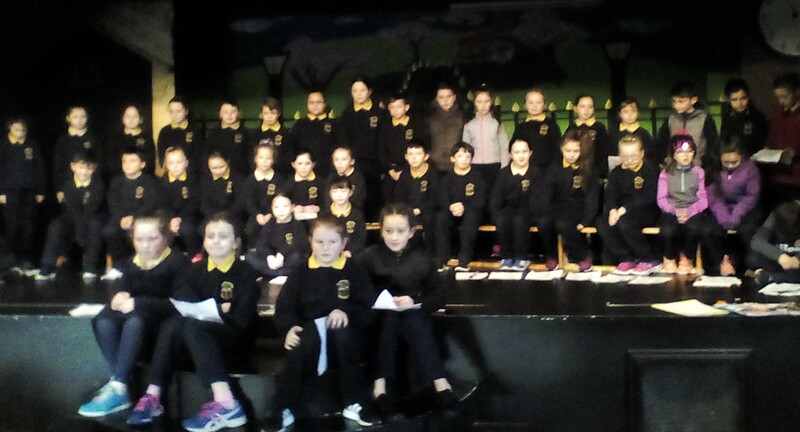 Everybody did very well and we are now looking forward to May the 19th when we will receive our First Holy Communion. 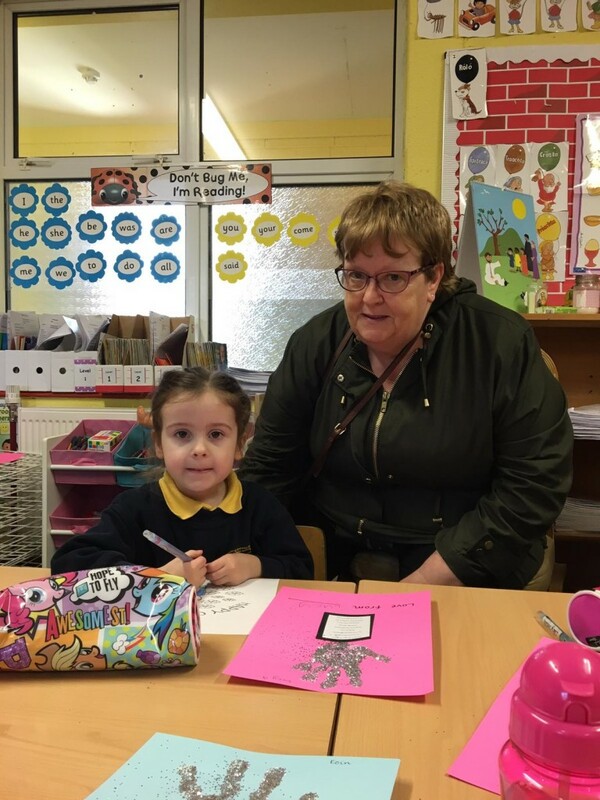 1st Class: We learned about crocodiles and wrote reports on them. 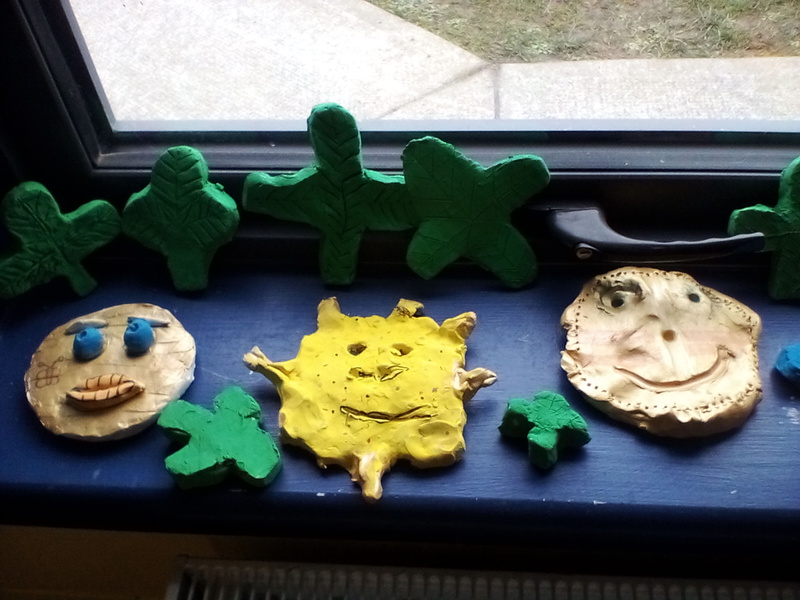 We have them displayed in our classroom along with our Crazy Crocodile Art! 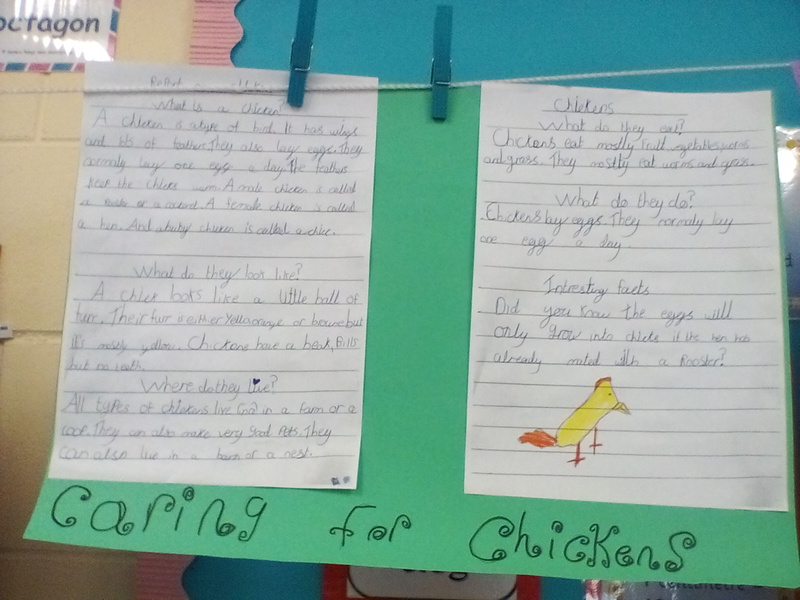 3rd Class: we are very busy researching all about an animal of our choise and writing reports. 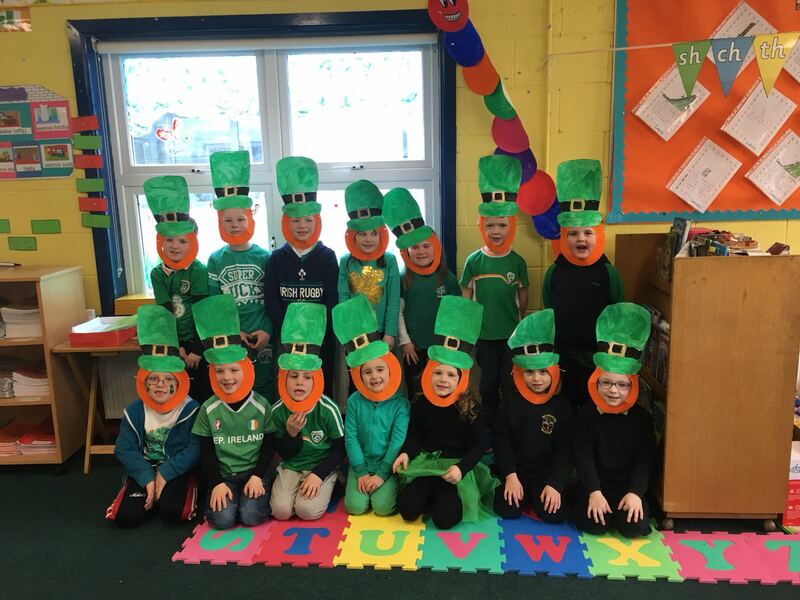 We are currently learning all about St. Patrick in history class. We will also be entering a handwriting competition next week so we are practicing our handwriting a lot! 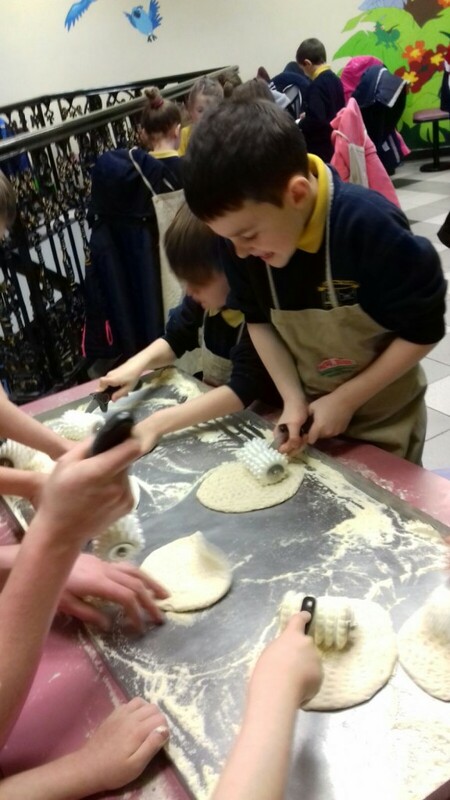 5th Class: we are were very busy this week learning all about trade products and how they benefit farmers and families in other countries. 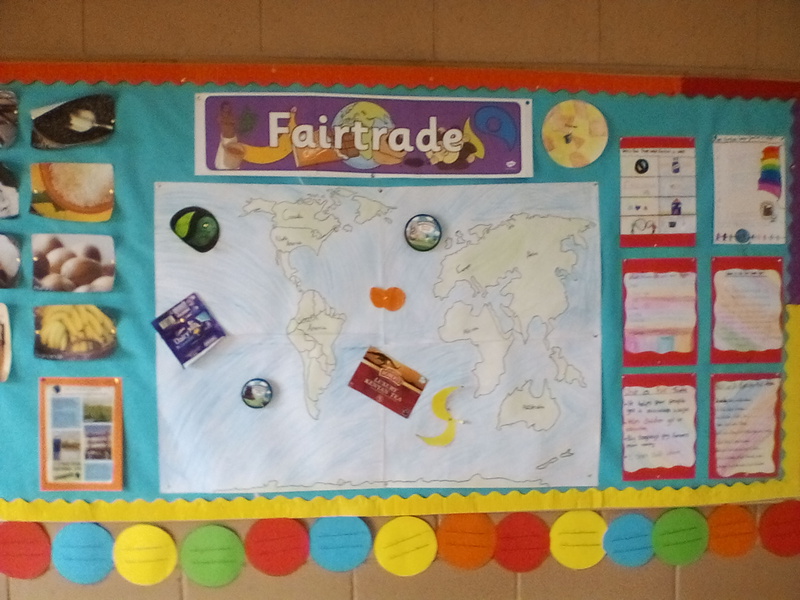 We collected fairtrade foods and learned about fair trade soccer balls. 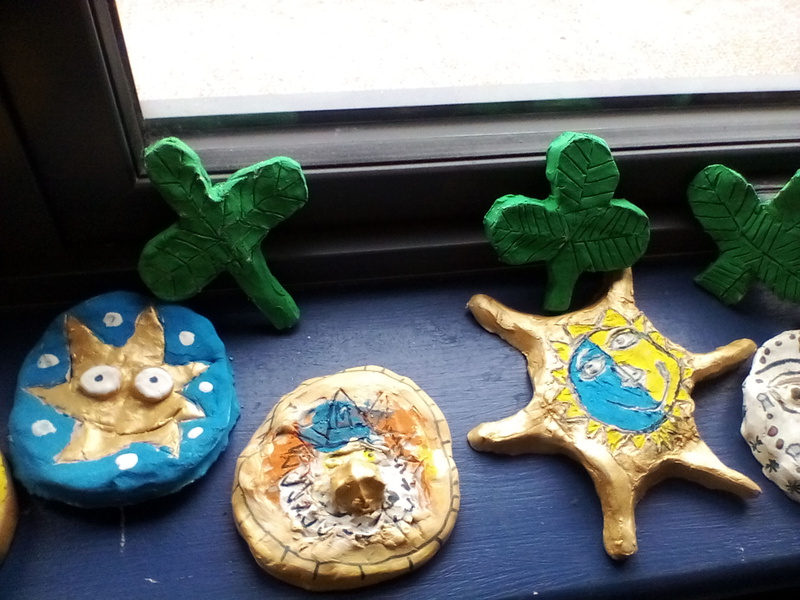 5th Class: we were working with clay this week and were tasked with creating Shamrocks and Sun Dials. 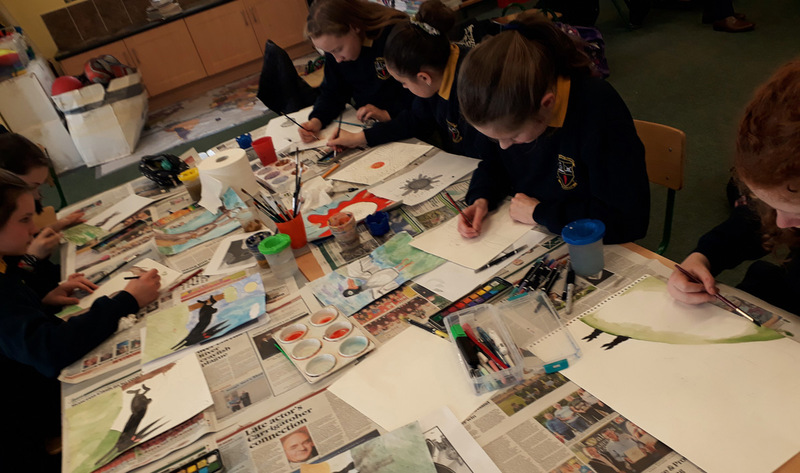 6th Class Blog: as always our 6th class students have been busy updating their blog ( click to view blog ). 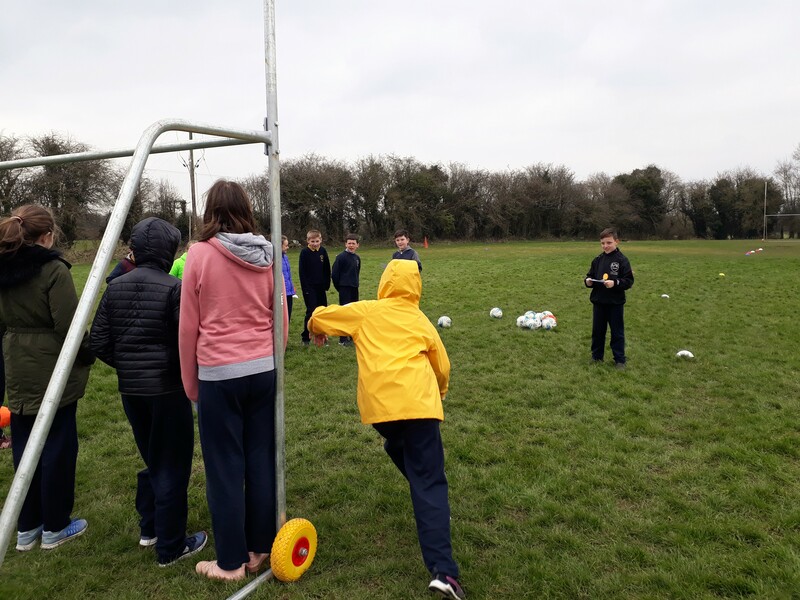 Recently, Aaron and Conor were our student teachers and they taught a very enjoyable soccer lesson. 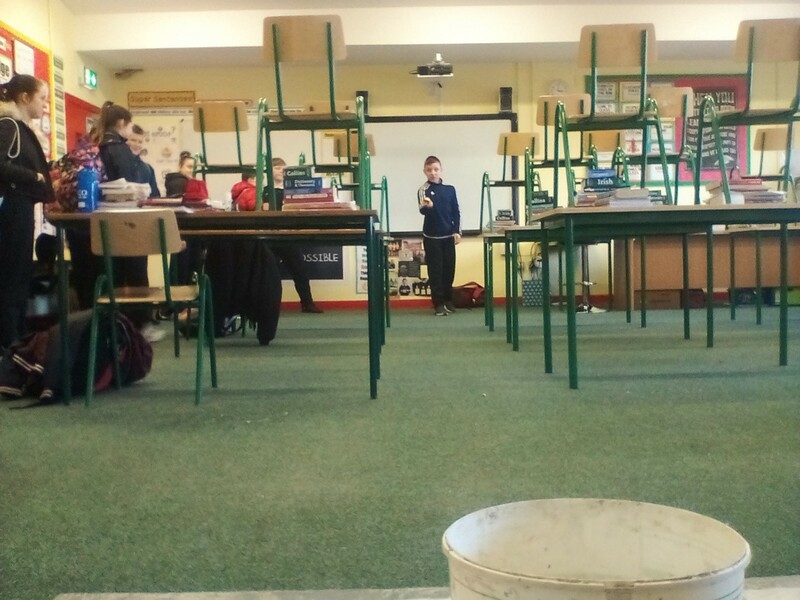 Leigh was another of our student teachers and he chose to teach an interesting golf lesson! 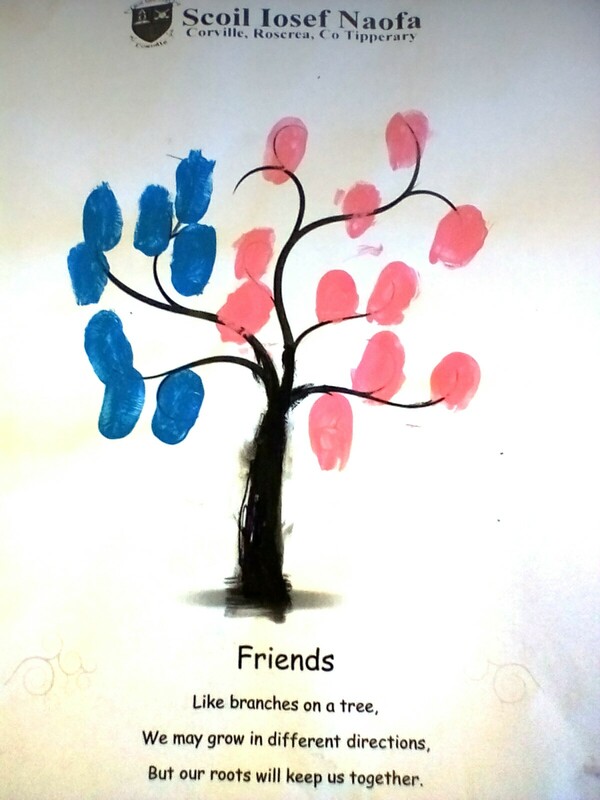 Matthew was the winner of the Guess What competition and our bloggers wrote about the tree of knowledge in the classroom. 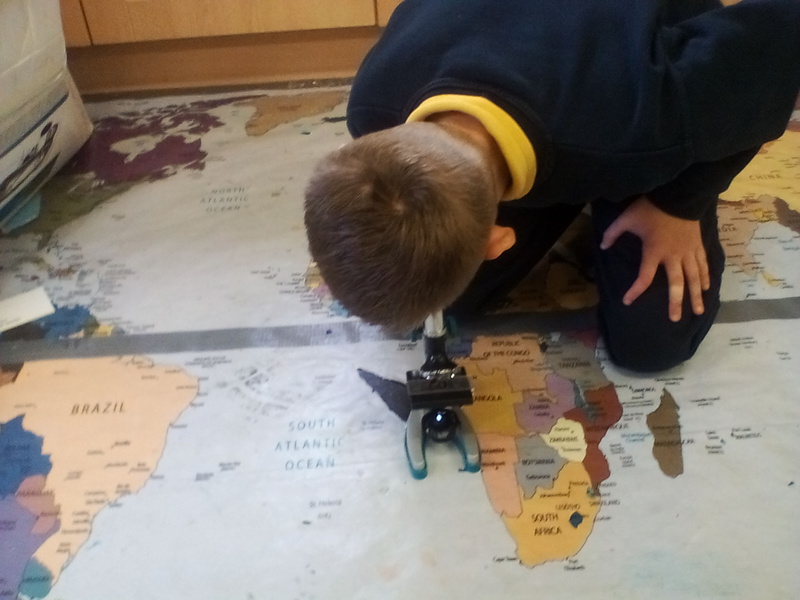 The latest update was very interesting as the class are creating a vlog (video log) to track the progress they are making with one of their projects. 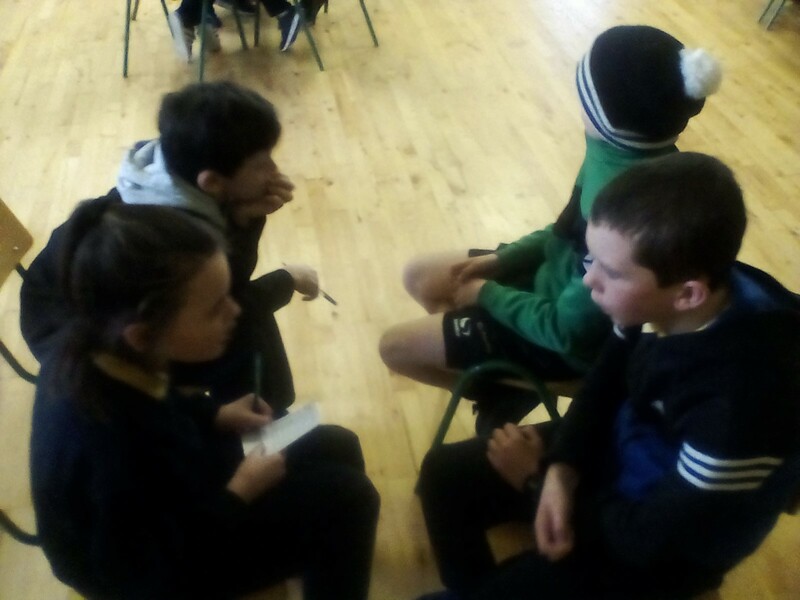 Our news team interviewed Conor and Aaron on their part in the Watership Down project (it only took 26 ‘takes’ to get the video right!). They hope to update the blog with regular videos and a final news broadcast live from Watership Down. Sounds like fun! Killavilla Girls Soccer: it is great to see so many girls from the school out playing soccer with Killavilla. The fact that the team seems to be winning all round them is an added bonus! 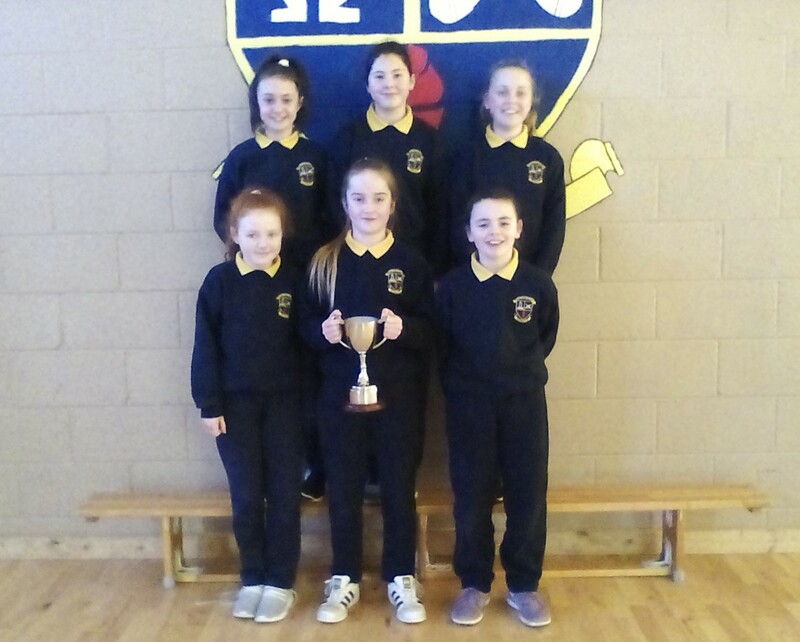 Here we have Corville members of the girl’s U/12 team after their latest cup final win. 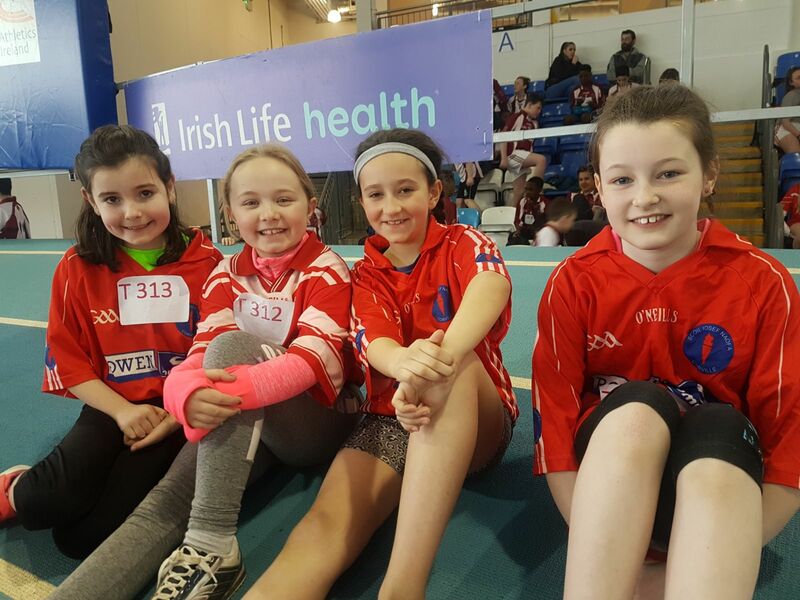 We encourage all our girls to join their local clubs whether it’s soccer, camogie, football, athletics, badminton etc. The mid-term break is upon us and we hope everyone enjoys the few days off. We have a few news items to share with you as it was a busy few days for us leading into the break. Before we get into that, we urge you to visit our school Facebook page and give us a Like ( click here ). This will help you keep updated with everything that is happening in the school and there are always lots more photos available there. 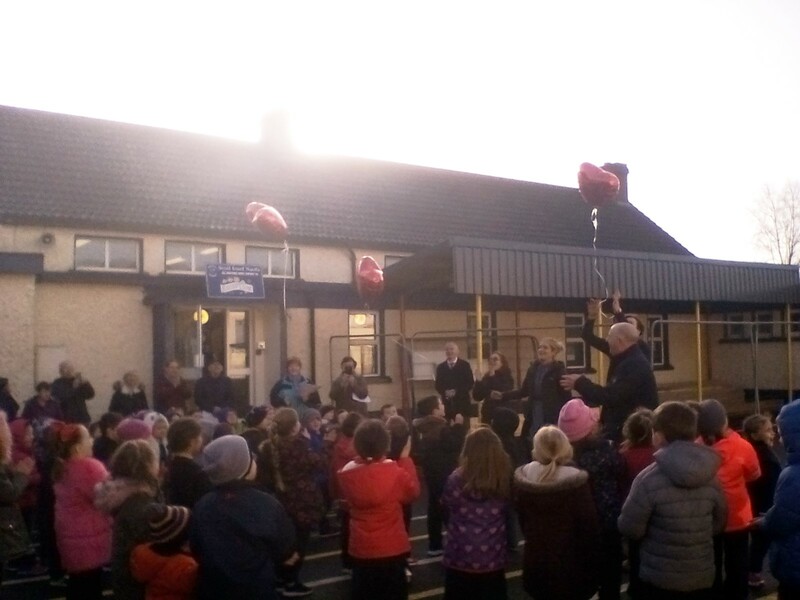 On with the news……..
‘Songs from the Heart’ CD Launch: the school choir launched their Valentine’s Day CD on Wednesday. 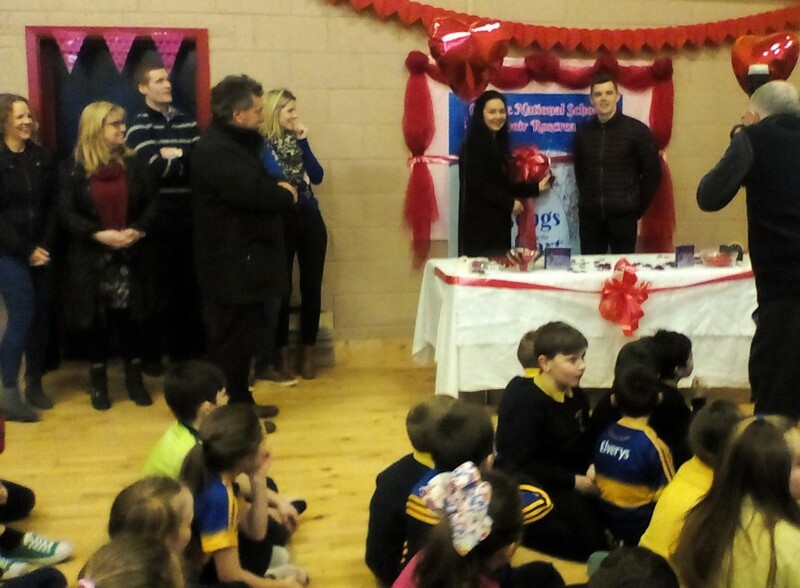 It was a very special day for the school as a lot of hard work went into this CD and we were delighted with the end product. 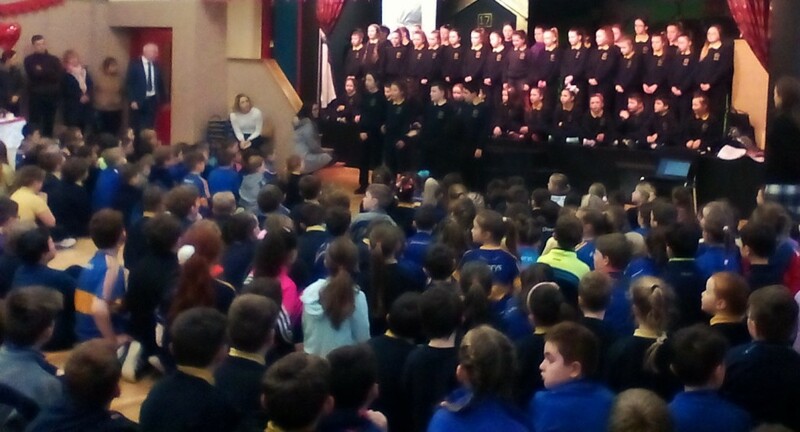 To launch the CD we invited the Corville community into the school hall to hear our choir singing 3 songs, the highlight being a great rendition of How Far I’ll Go from Moana. 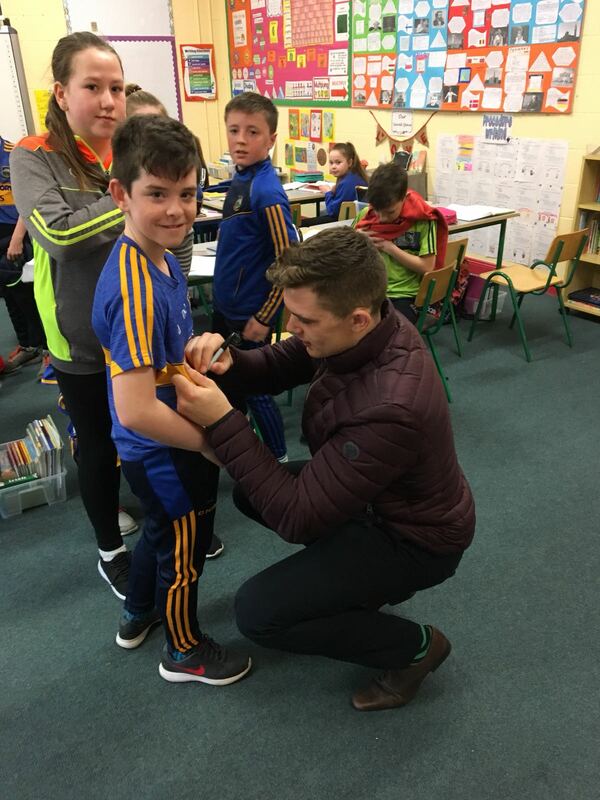 Tipp hurling star Ronan Maher was there to help launch the CD and he signed plenty of copies when they went on sale. 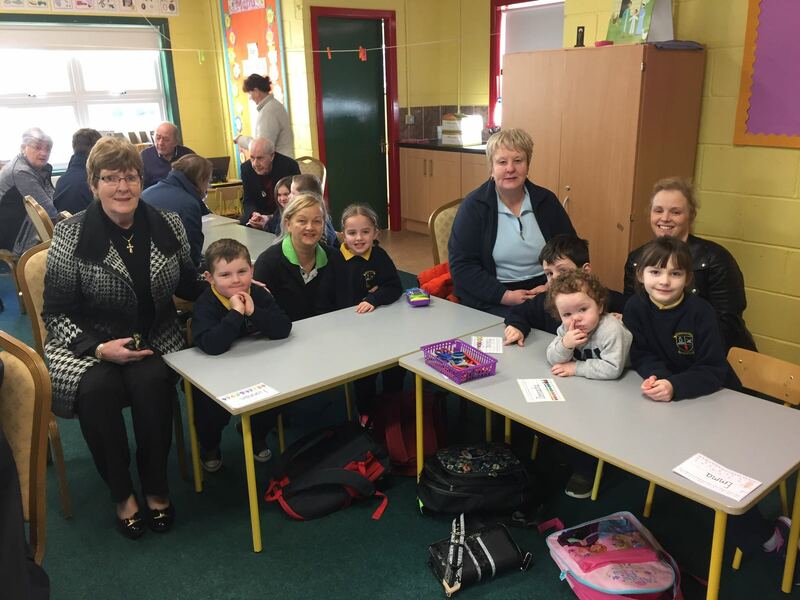 The children were also featured on Tipp FM with songs from the album being played and there was an interview with Ms. Browne. We received plenty of praise for our efforts and all the student and tachers involved in the project are on cloud nine. 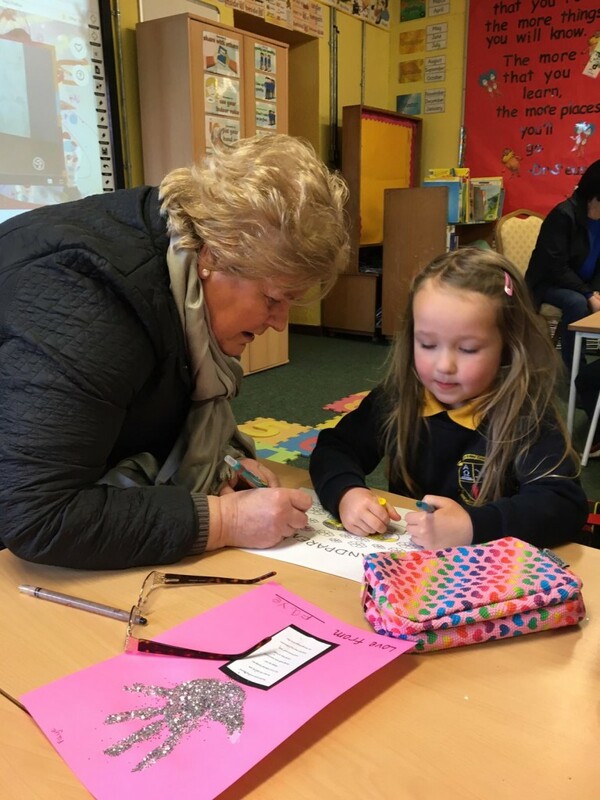 This CD is raising much needed funds for the school and can still be purchased from the school for €10. Here is another sample song – Bonfire Heart ( click to listen ) Enjoy!! 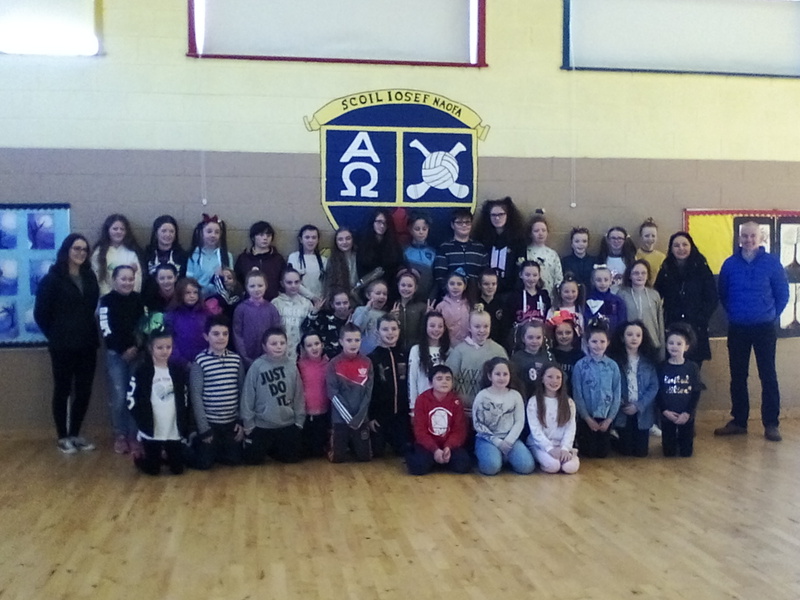 Fundraising: the school recently held a ‘Crazy Hair Day’ fundraiser for 5th class student Cian Kruse. 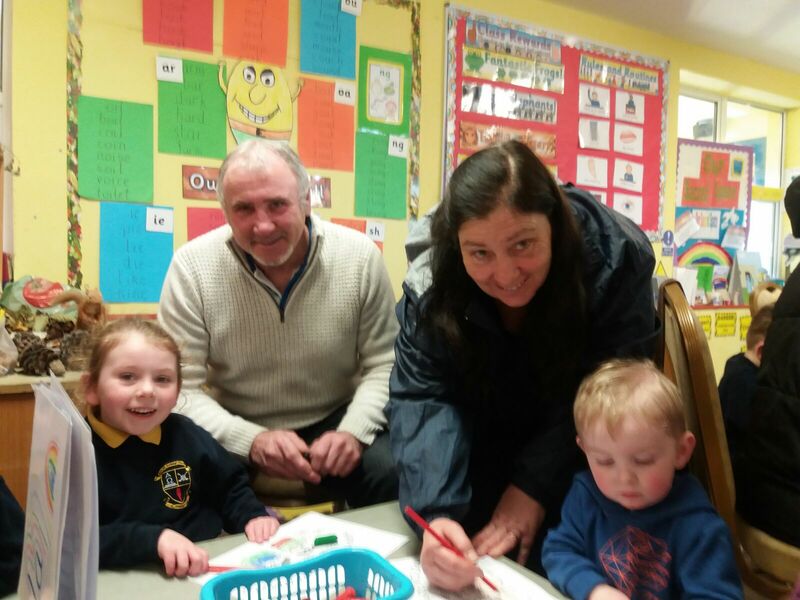 We were delighted with the response from the community and the generous donations given. We managed to raise €900 from the day. 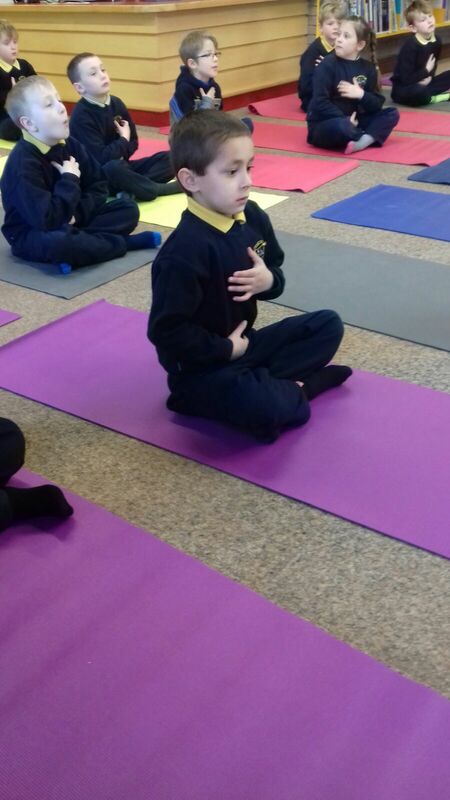 Amber Flag: Talk on Mindfulness – we welcomed teacher and author Siobhán Hackett to the school last week to give a very interesting talk on mindfulness to our 5th and 6th class students. The students learned many important strategies for dealing with the problems they might be experiencing. This chat will empower Corville children to believe that regardless of what obstacles they are presented with in life they can succeed. Ash Wednesday: Fr. Harding and Fr. 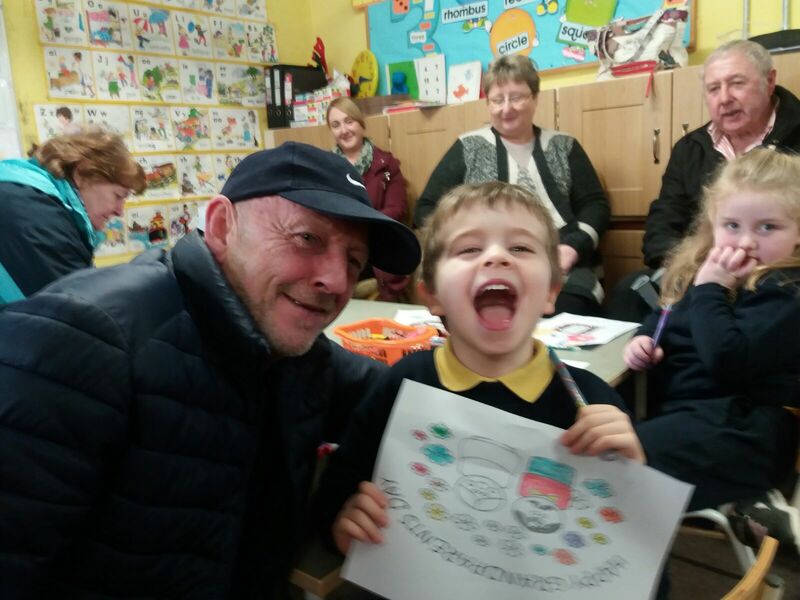 Treacy visited the school on Wednesday and the students received the traditional ashes on their foreheads. This marks the start of Lent so hopefully all our boys and girls will try to give up something for those 40 days! 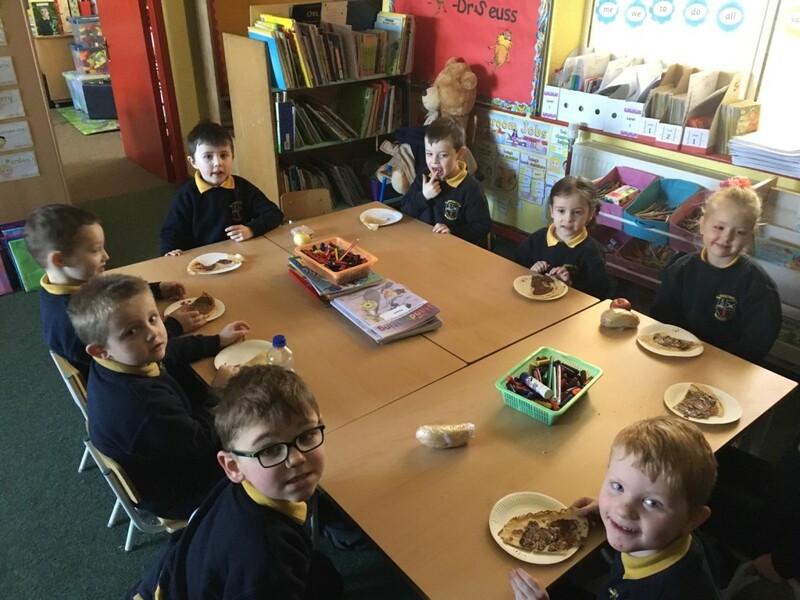 Pancake Tuesday: the unmistakable smell of pancakes hit all corners of the school on Tuesday as each classroom was treated to some pancakes. 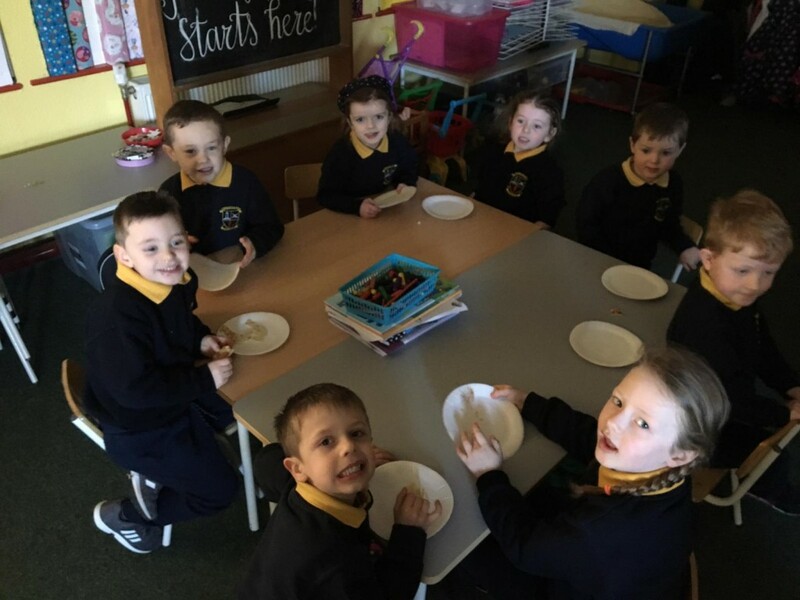 Junior Infants had the easier task of eating them, while the 6th class students had to make their own! Making Slime! 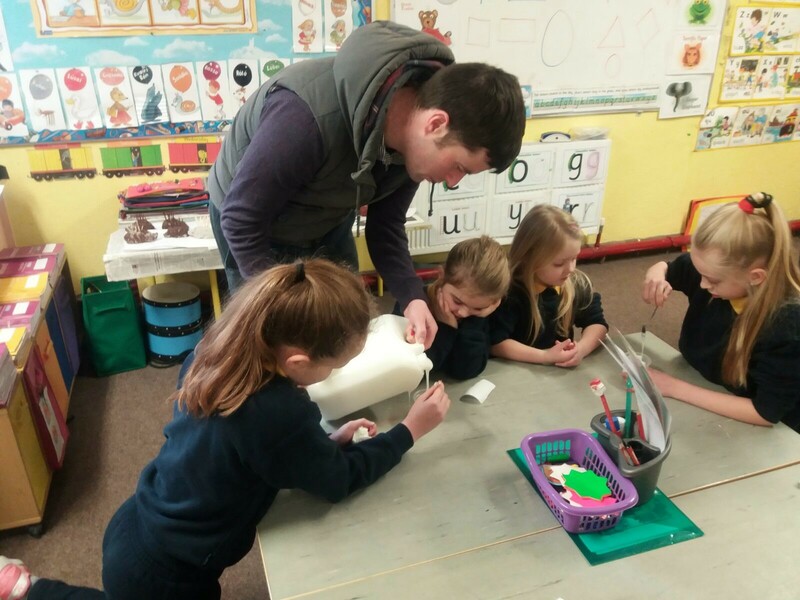 Mr. Phelan and his students from 4th class visited our junior infants to help them make slime. It was all pretty disgusting but the students seemed to love it! 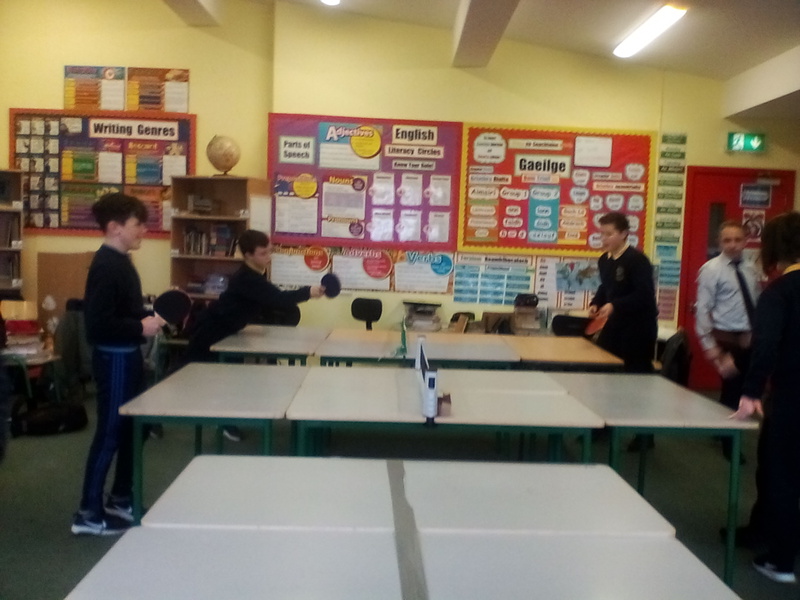 6th Class Blog: they have 1 more update on their blog ( click to view blog ). 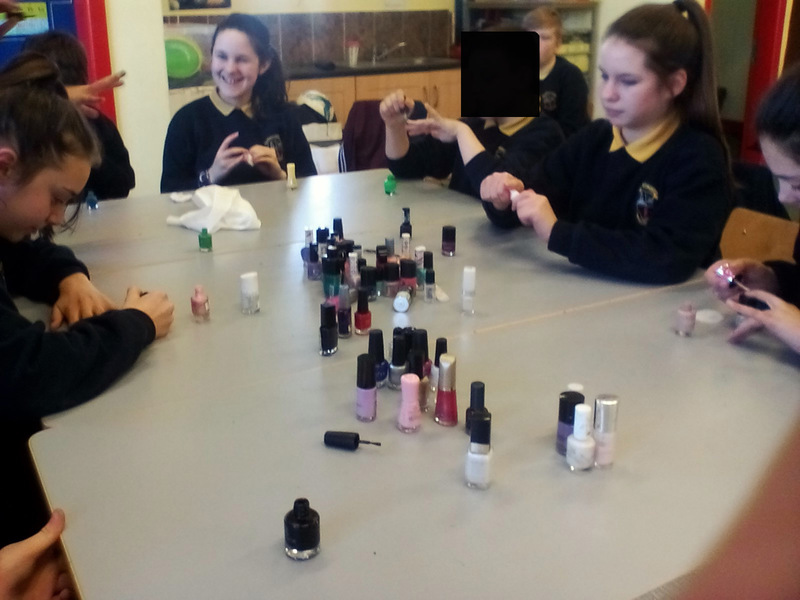 This week their student teacher was Katelyn O’Rourke Morgan and she taught a very enjoyable lesson on fingernail painting. Even the boys joined in for the laugh! There were also updates on their ‘Get out of Tests & Homework’ free throw and they all learned the meanings of their names e.g. Magdalena was our 2nd student teacher of the week and she taught all the class how to make pancakes. She did an excellent job. 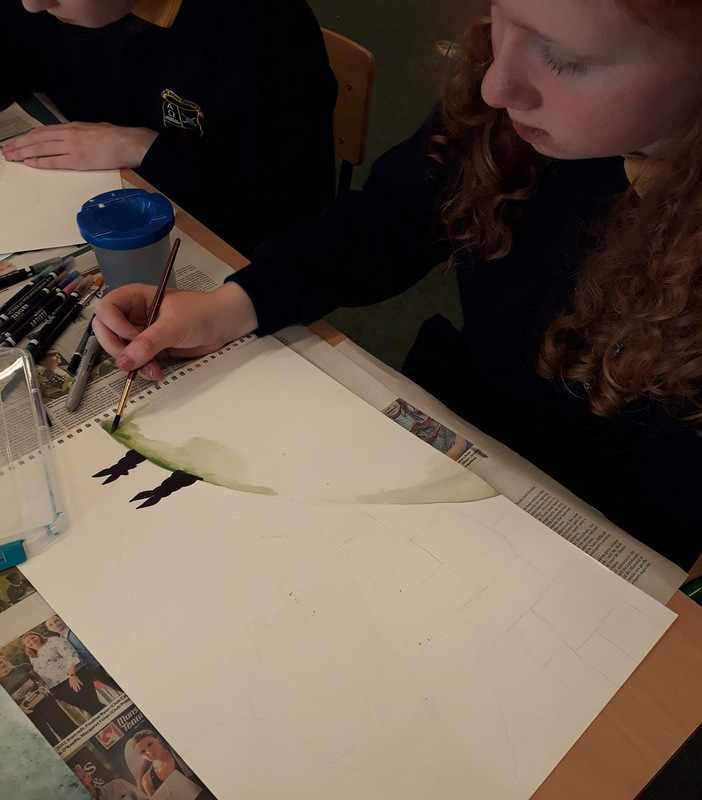 They also had their weekly meeting where they prepare for the transition to secondary school and they continued their watercolour painting work. 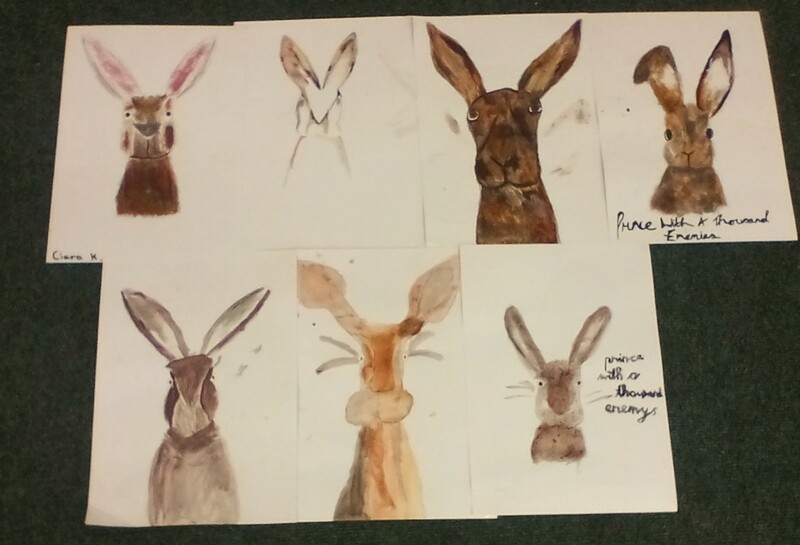 This week they were tasked with painting rabbits! 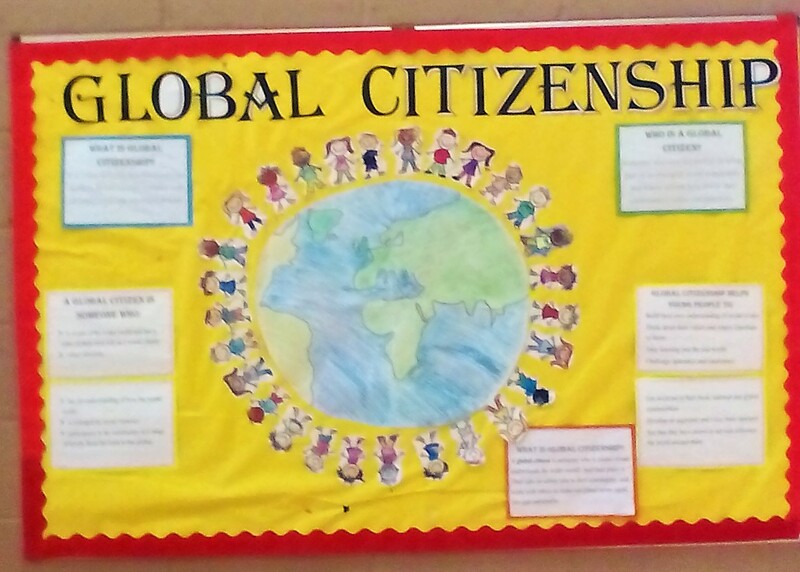 Term two has got off to a great start with some great things happening in the school. The big news is the break through success of our quiz team. 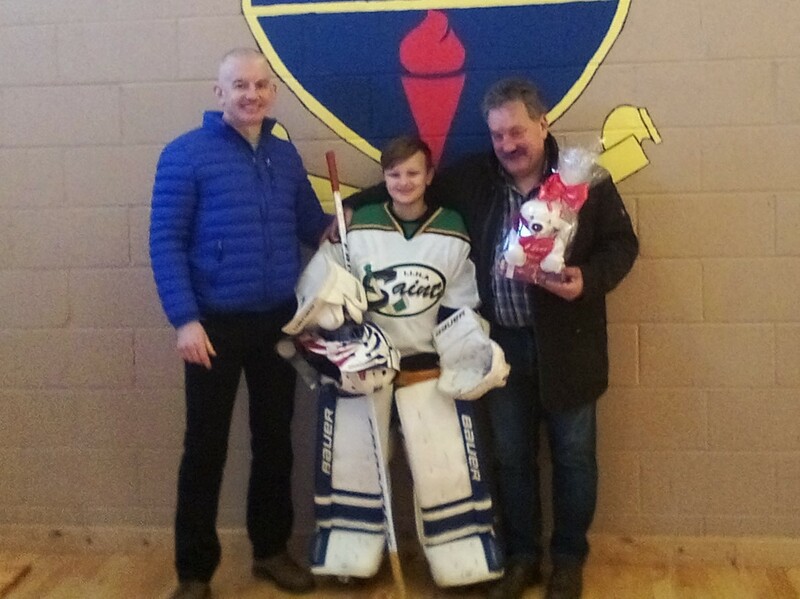 One of our students, Nikita, also represented Ireland in Ice Hockey recently. Our school choir have a brilliant new CD for sale for Valentine’s Day. 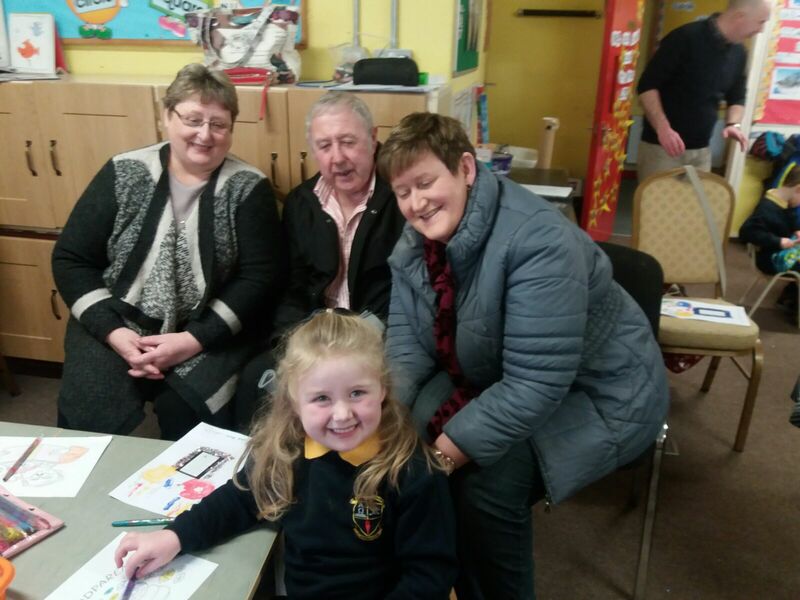 We celebrated Grandparent’s Day in school. 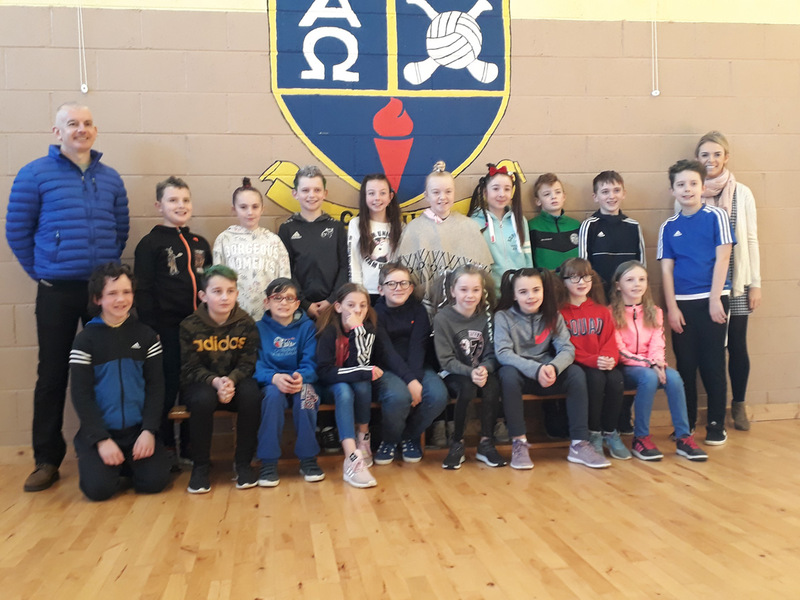 Our 6th class continue to update their blog with interesting activities and to top it all off, we had a crazy hair day in school today on Friday! 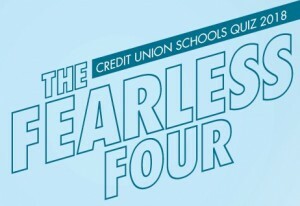 Credit Union Quiz: Credit Union Quiz: the school had a huge break through recently at the annual Credit Union Quiz. We have been putting in a big effort over the last few years to try to mix it with the best. We have come close over the last two years with two 2nd place finishes and two 3rd place finishes in the U/11 and U/13 competitions. While these were fine achievements for the school and those students that took part, only the 1st place teams progressed on to the next round. This year, under the guidance of Mr. Scully and Ms. Maher, we put in our biggest effort yet and we had great success once again. 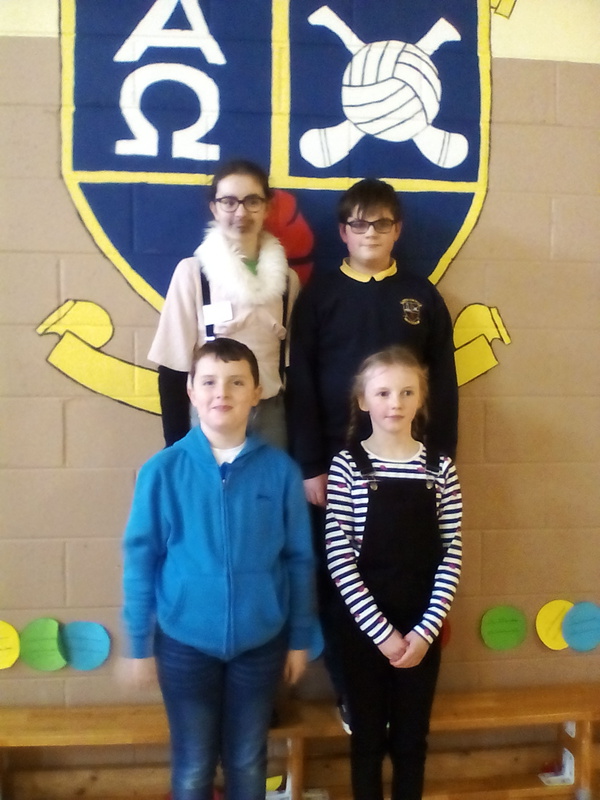 Our U/13 team of Ross, Ryan, Kiera and Frankie finished in joint 2nd at the end of the main quiz (beaten into 3rd on a tie breaker). 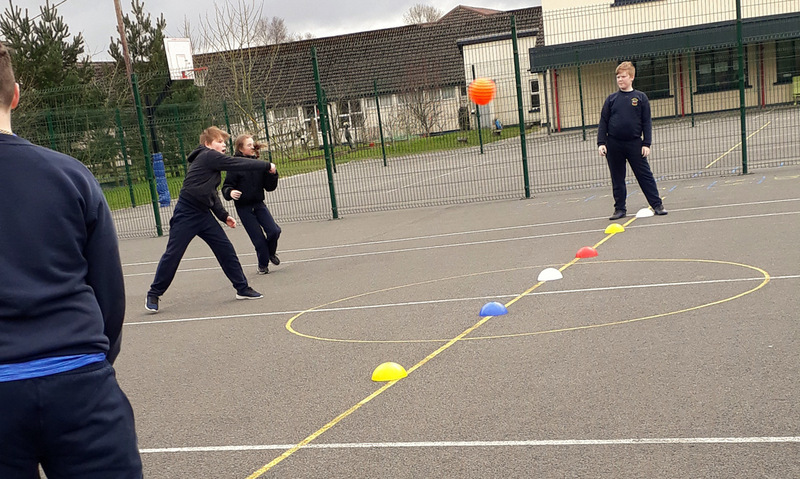 This was a great effort as the students were up against some excellent competition. 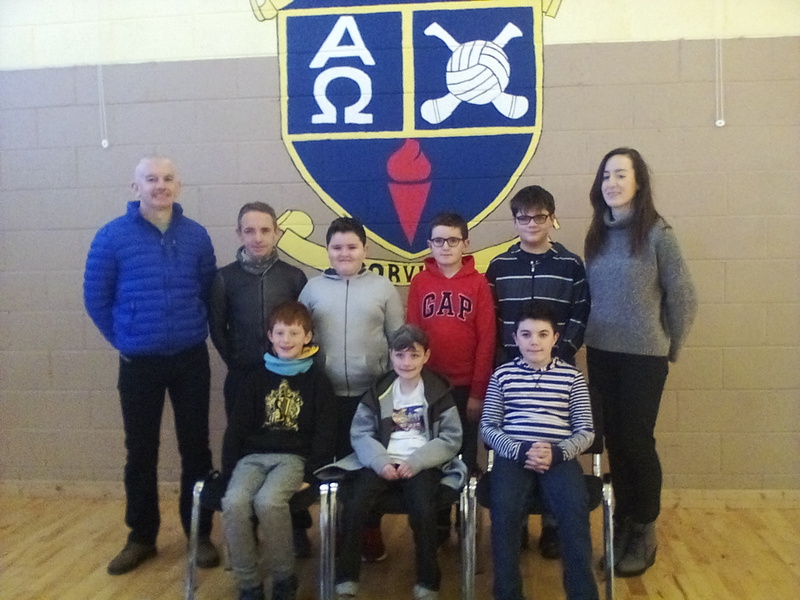 Our U/11 team of Senan, Karlo, Roy and Dan went one better at the end of the main quiz by finishing in 1st place. They were all absolutely delighted to have done so well. The team now progresses onto the 2nd round of 3. 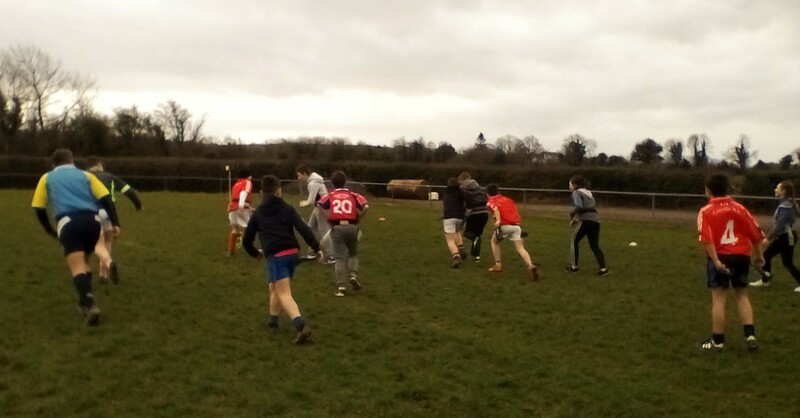 Hopefully they can make it to the All Ireland final, but there is a lot of hard work ahead of the team. This goes to show that Corville are a match for anyone and that talent and hard work can bring you a long way. Take a bow everyone involved – ye deserve it. Songs from the Heart: we are delighted to announce that our new CD is ready for sale just in time for Valentine’s Day. This will make the perfect Valentine’s Day gift and it will also raise vital funds for the school. All the students and teachers involved in this production have put their hearts and souls into it and deserve a lot of credit. You can purchase the CD for €10 from the office. and here is a photo of our wonderful school choir and their hard working teachers! Like us on Facebook: To keep up to date with all things Corville, visit and like our Facebook page. Ice Hockey Star! 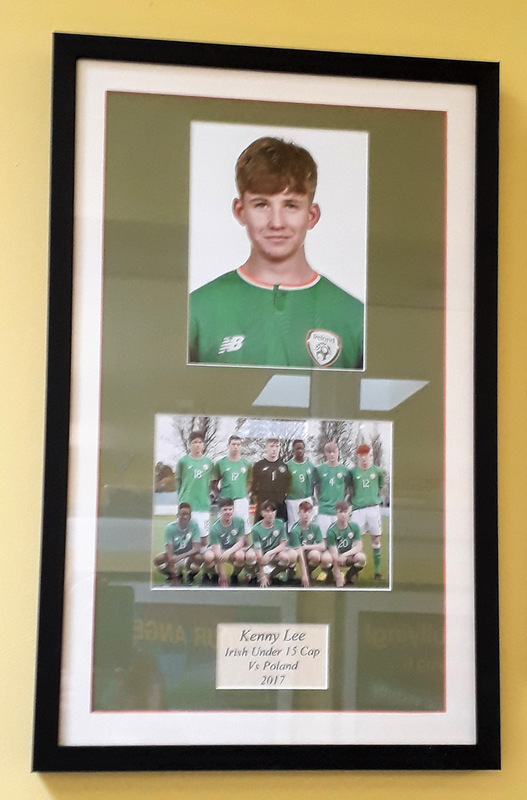 Corville celebrated another magnificent sporting achievement when Nikita Chuhunou, a 5th class pupil, travelled to Seoul, South Korea with the Irish National Hockey Team. Nikita is the goalie with the Irish team. The Irish team overcame Korea by 3 goals to 2. 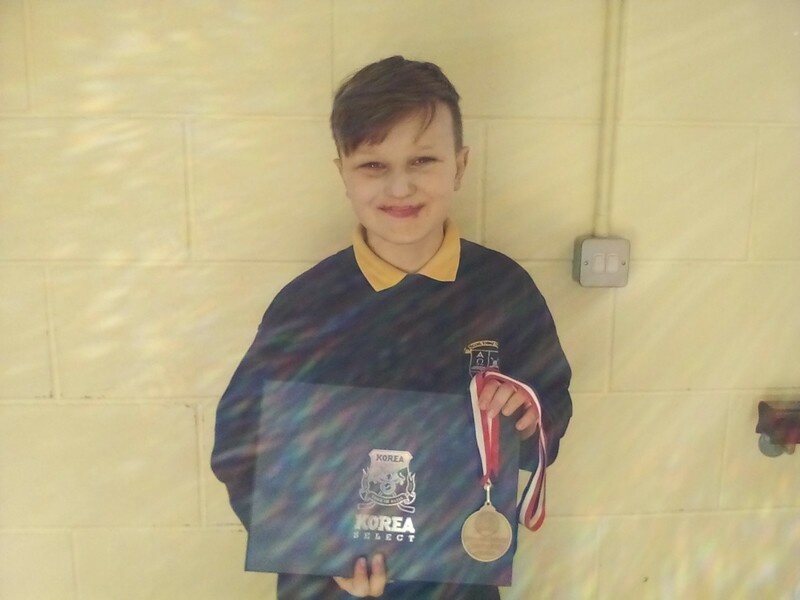 We are so proud of Nikita and we wish him every success in his Ice-Hockey career. Sporting Updates: training for our sporting teams is well and truly back underway. On Mondays after school we have soccer for boys and girls 3rd – 6th. The FAI soccer tournament will be taking place in March so we need to see as many out training for that as possible. On Monday after school we also have tennis training on the courts. 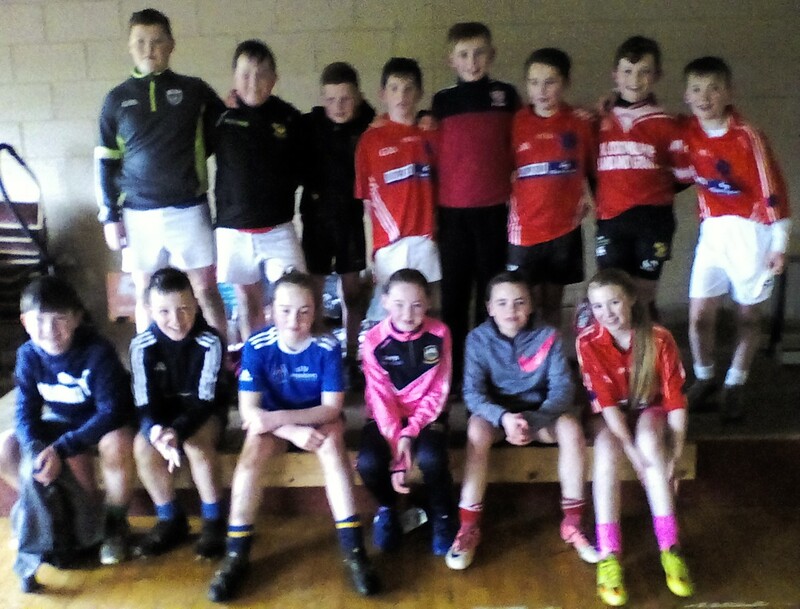 On Tuesday and Thursdays there is hurling and camogie for boys and girls from 3rd – 6th. The quiz team also practice on Tuesdays and Thursdays. 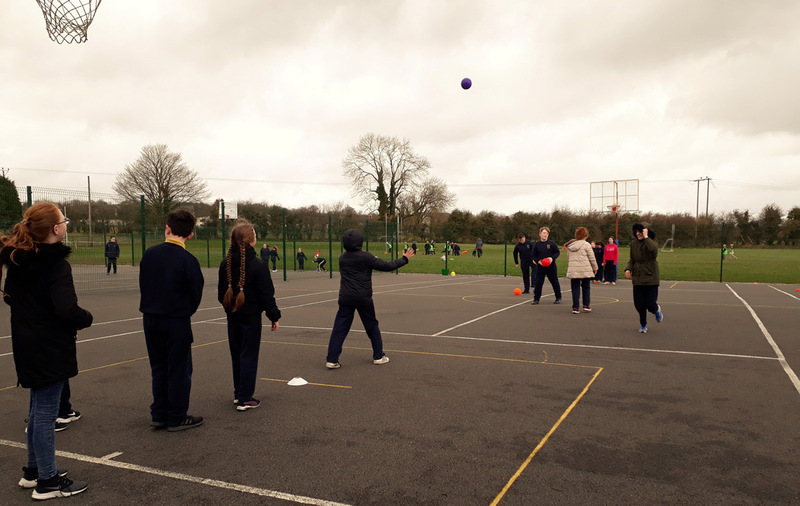 We also have tag rugby in the school so there is plenty there for everyone. Everyone is more than welcome to come out training with us. You will get fit, have fun and make friends. 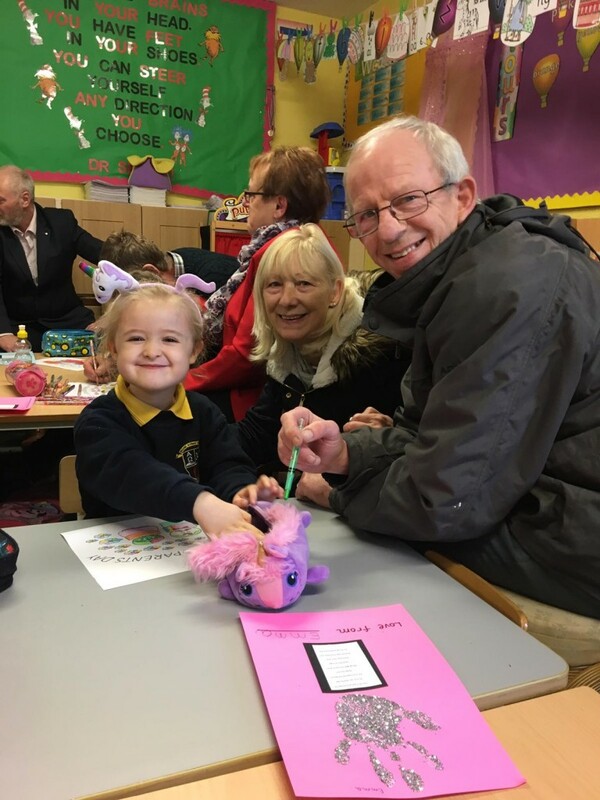 Grandparents Day: the school celebrated grandparent’s day by inviting in all the grandparents of our infant class students into the school. They came in and visitied the classrooms and then went outside where we released balloons into the air. 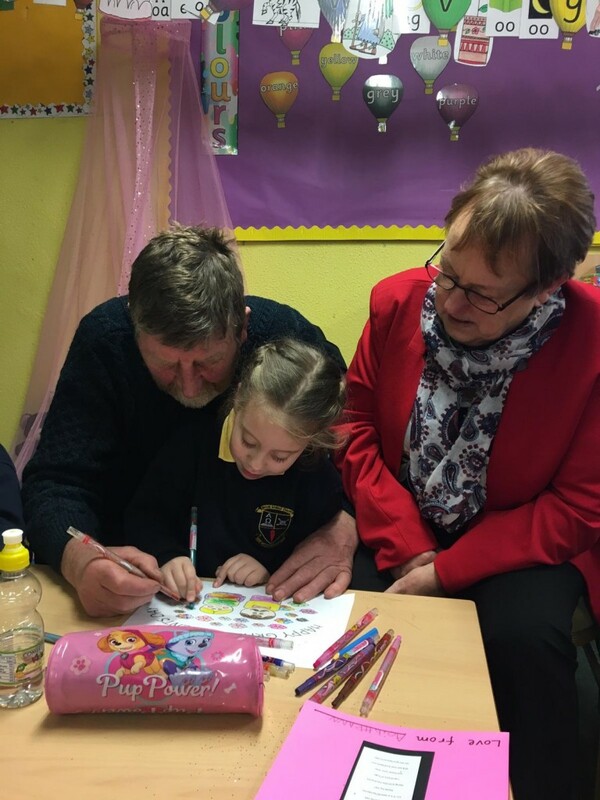 The infants were absolutely delighted to see their grandparents helping them out in class and it made for another great day in Corville. Happy 40th Birthday! 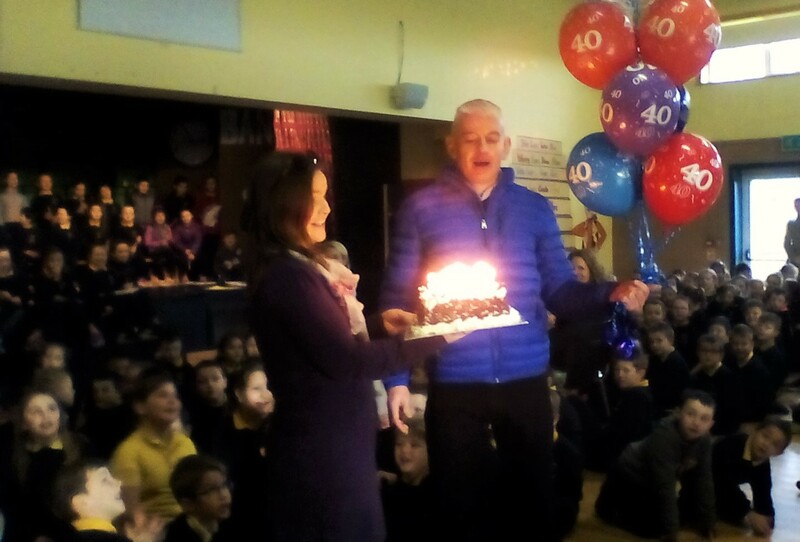 Our principal Mr. Slattery was lost for words (for once) last Friday when the school surprised him with a rousing rendition of Happy Birthday at assembly. I am not sure he wanted to be reminded that he is getting old but sure it happens to the best of us! Crazy Hair Day: the students (and some teachers!) 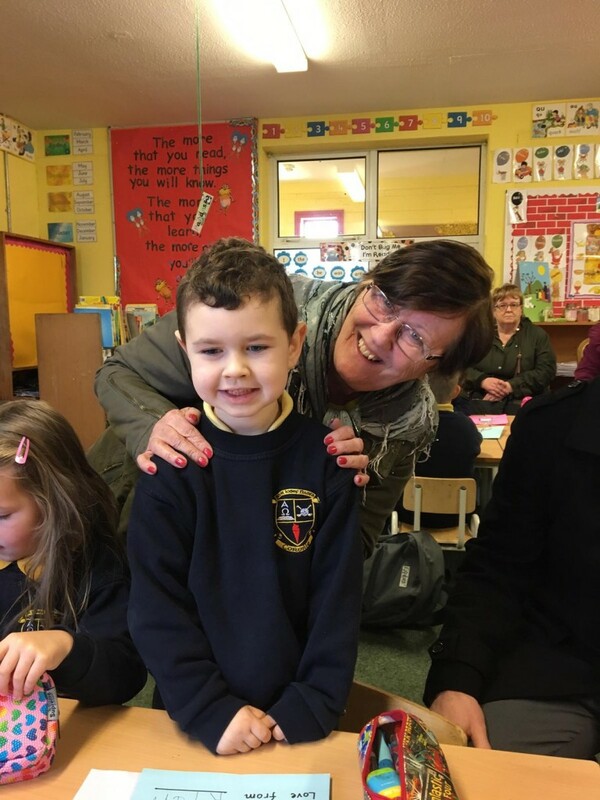 all took part in a crazy hair day in school as part of a fundraiser for one of our student’s Cian Kruse (pictured below). It made for quite the spectacle. 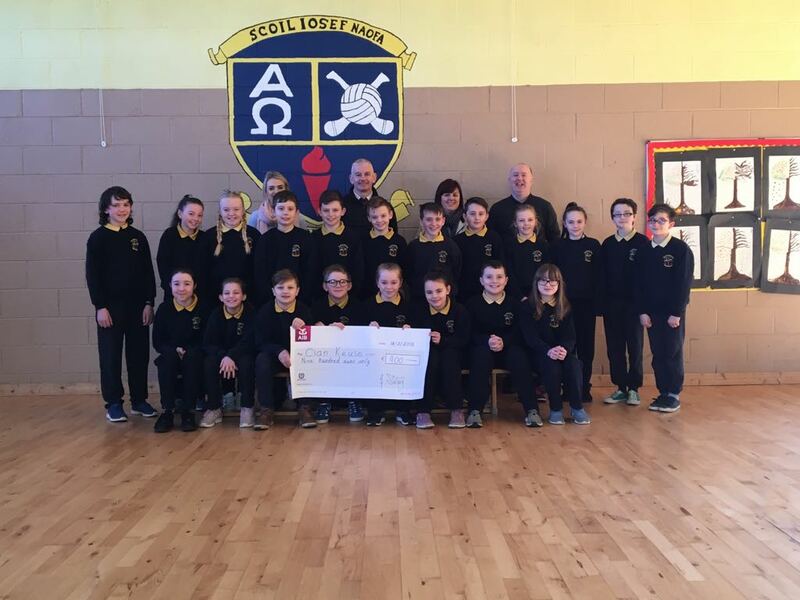 It was great to see the whole school getting behind this fundraising initiative. 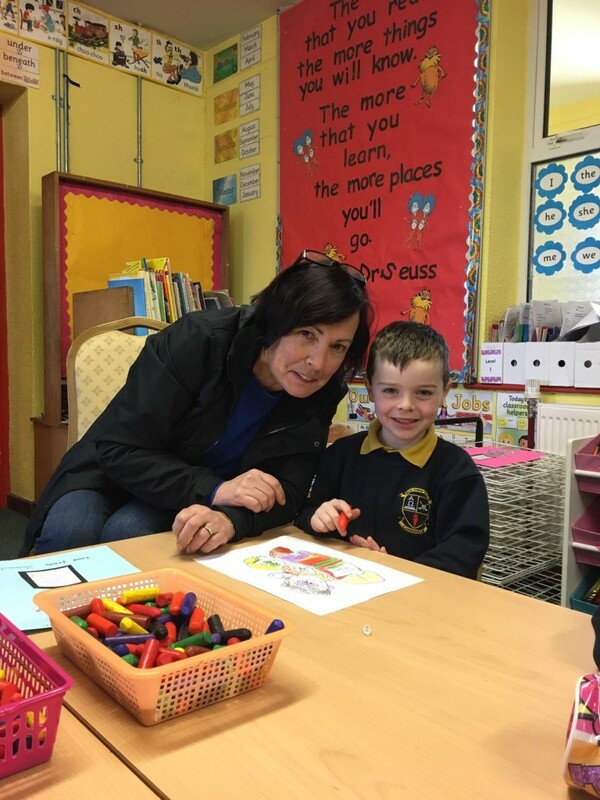 Kian is a very popular boy in Corville and we were delighted to be able to help out. 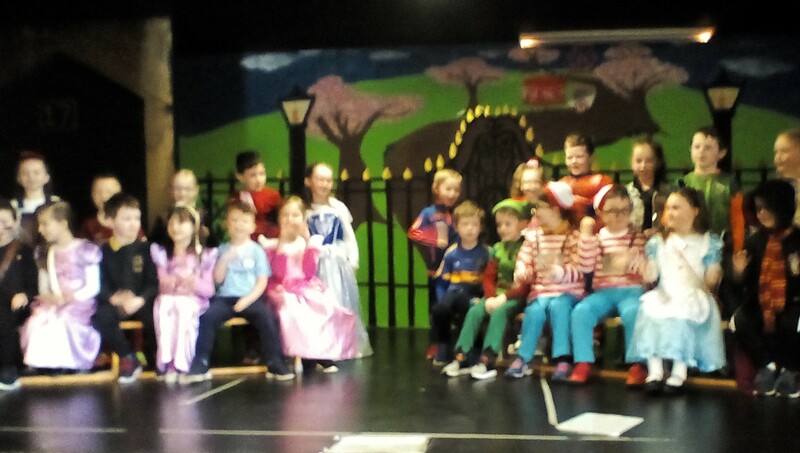 Assembly Performances: over the last few weeks we have had plenty more stunning performances on stage at our weekly assembly. The standard of performance is terrific and everyone that shows the courage to get up there and perform in front of the school should be very proud of themselves. 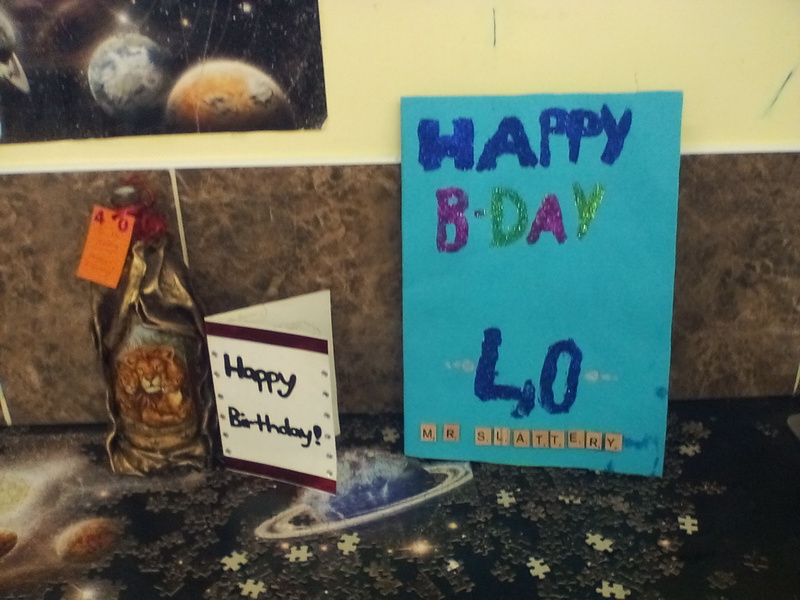 6th Class Blog: in their latest blog posts the 6th class student talk about Kiera’s success in the Credit Union Quiz, Anastasia’s great watercolour art lesson and they made a 40th birthday card for Mr. Slattery. 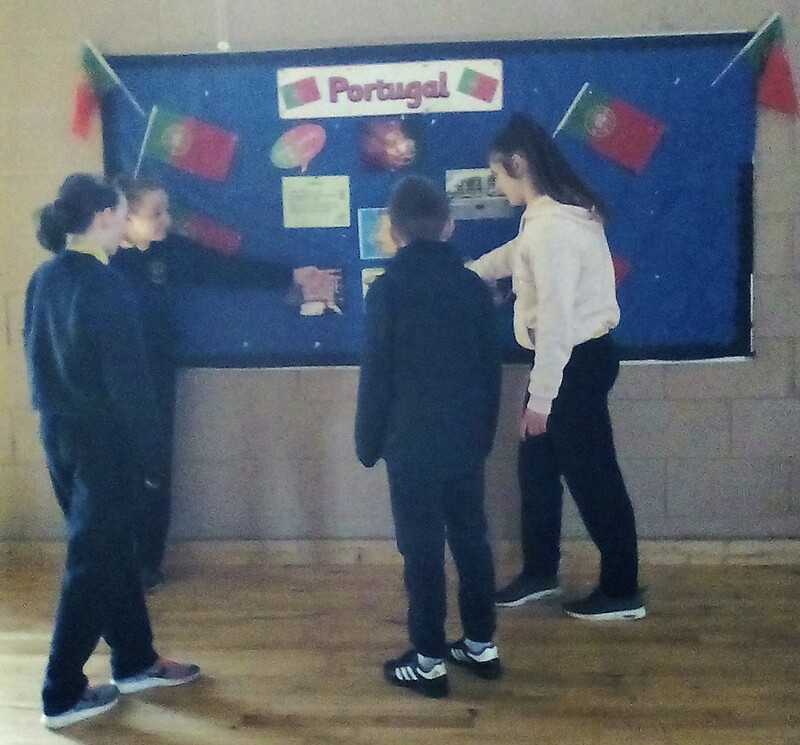 They found out that 4 of them will be heading to Portugal in April as part of the Erasmus programme. 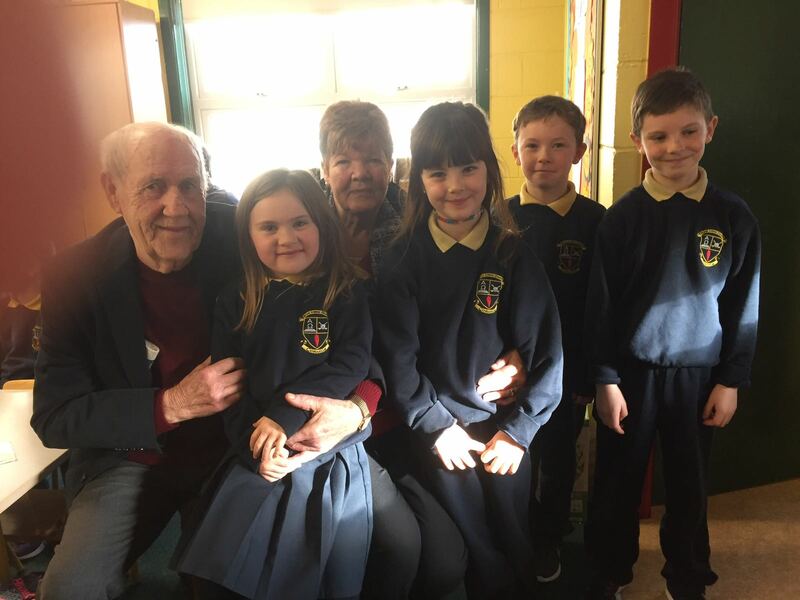 Ben Fogarty Dunne taught a great lesson on table tennis, Ella taught a lovely art lesson based on friendship and the class took part in a Buddy bootcamp with Junior Infants. 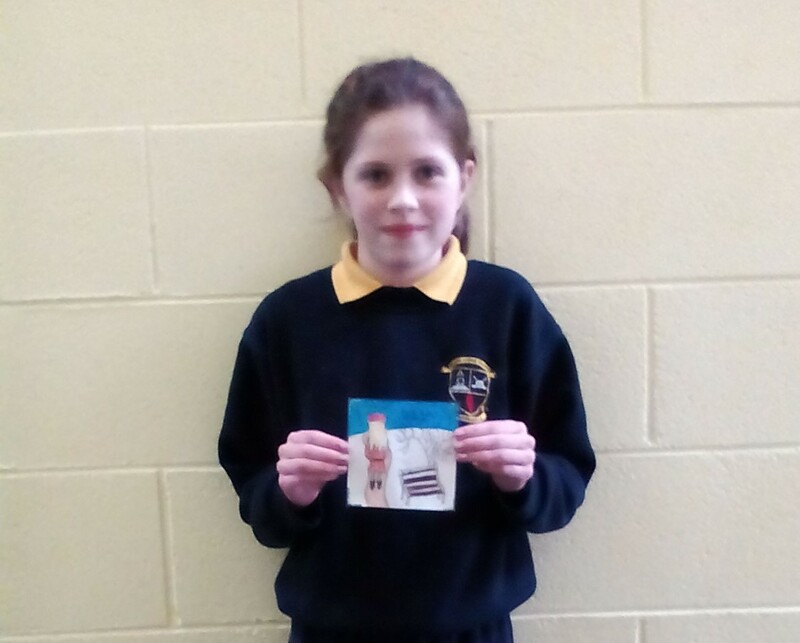 Previous to that, Molly taught a fun Irish Dancing lesson and a Baby Reel, they got to examine things up close using microscopes (dead flies – uugggh), and they learned that Katelyn had won the school CD design competition. Woohoo! You can follow their blog by – clicking here.